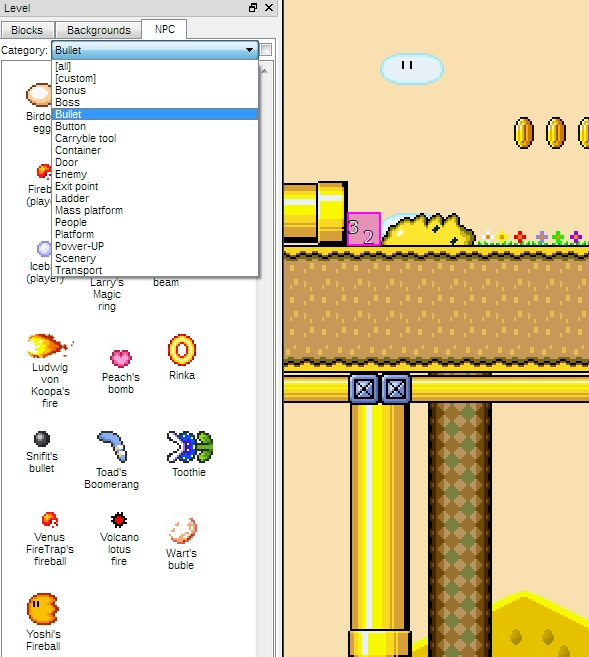 Here I am going to submit the latest alpha-versions of my engine components. 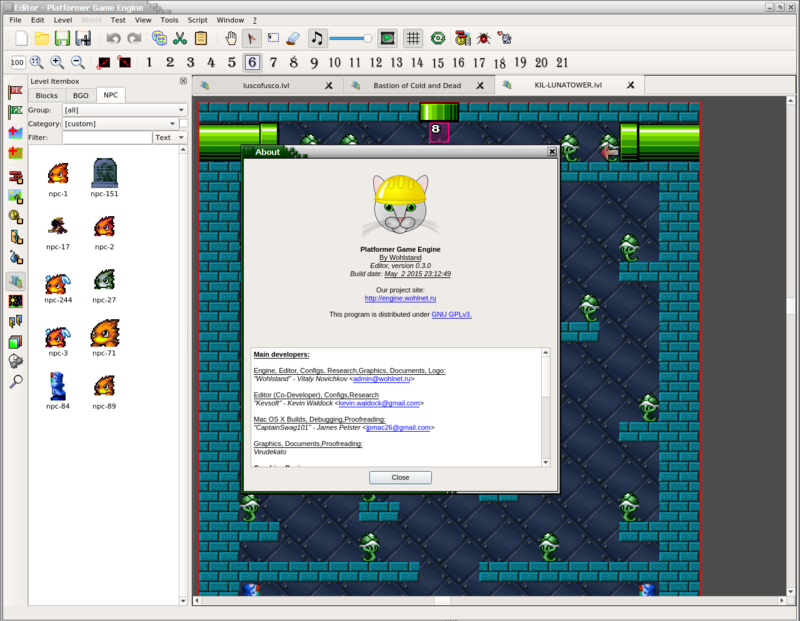 The development of the editor has started on 19 March 2014. 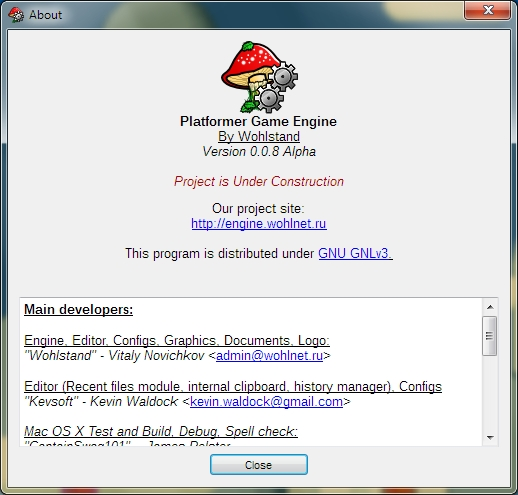 The development of the engine part has started on 30 September 2014. 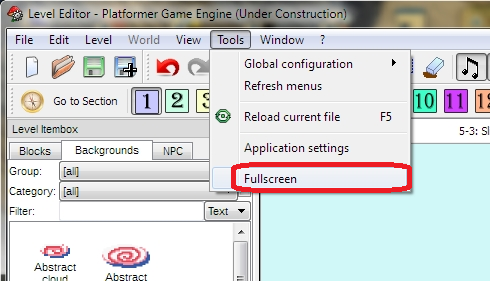 - Fixed a crash which possible if you pressing F5 keys too often. 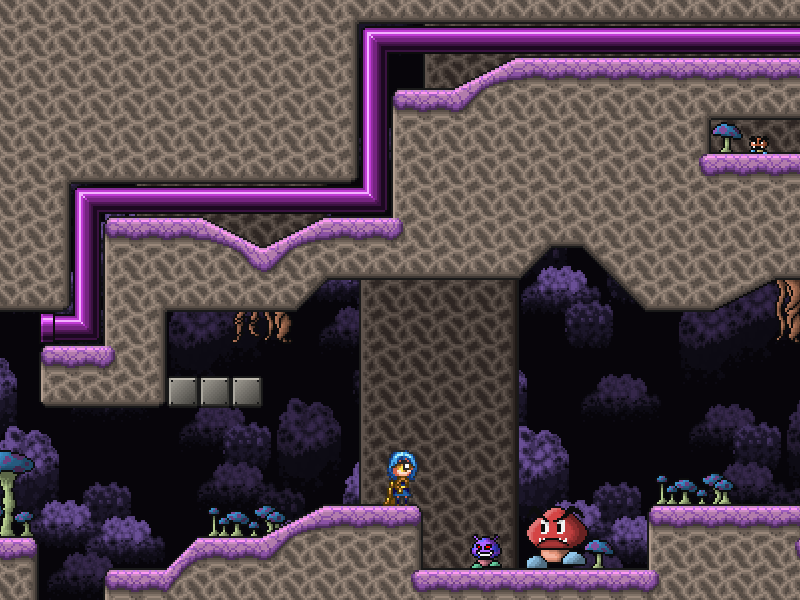 - Player can climb on NPC-based climbable walls, not only on the BGO-based! 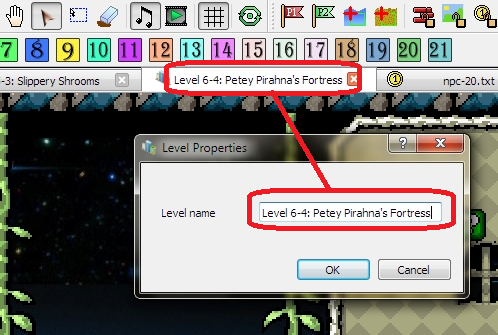 - NPC's finally can be spawned from blocks where there are was included! - Interprocess communication system is fixed for Linux and Windows systems! 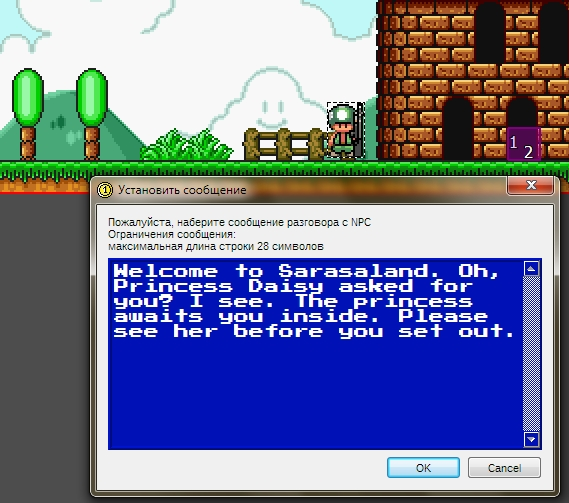 - Added more soft parsing of NPC.txt files. Instead of rejecting, you will be warned about wrong values but file will be loaded! 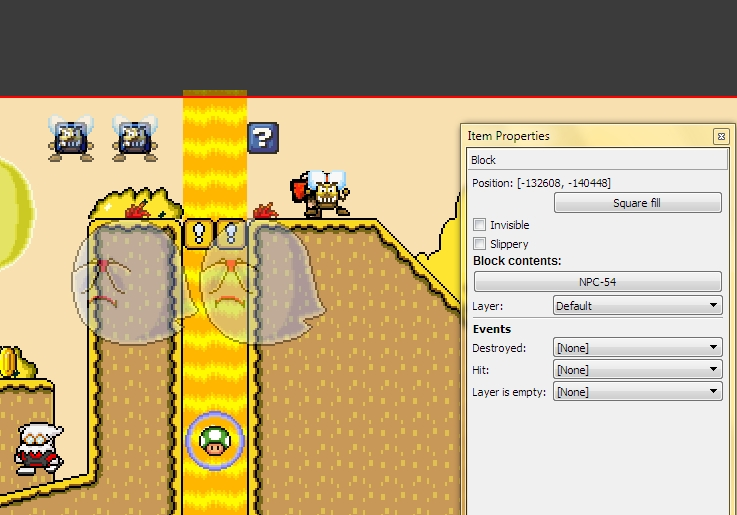 - Added history manager limit to prevent memory overflow. 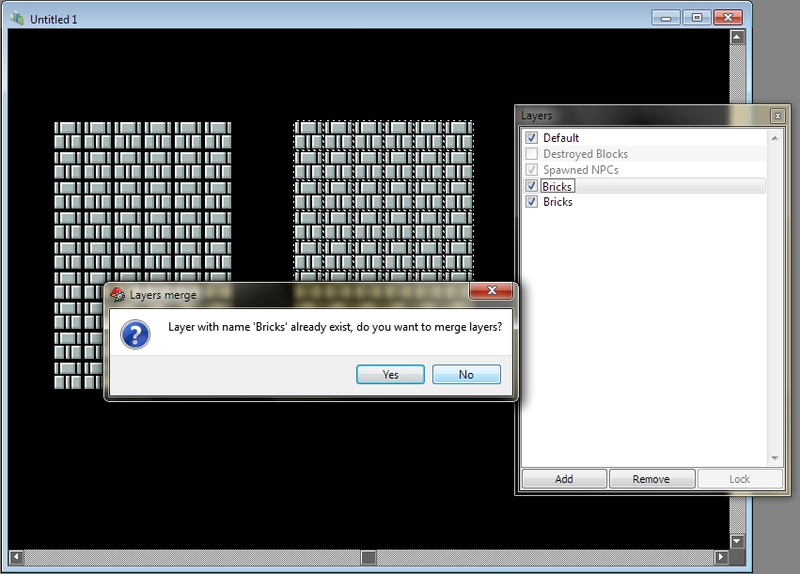 - Fixed a lots of bugs in the layers and events tool-boxes. - Fixed blinking of toolboxes on startup. 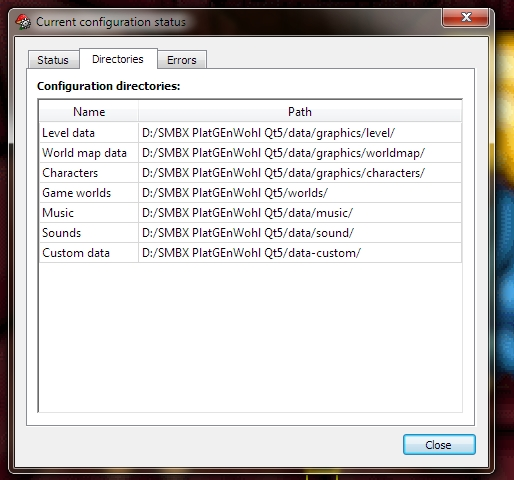 - Added SoX autio converter GUI to provide quick and easy audio files fixing toolset. 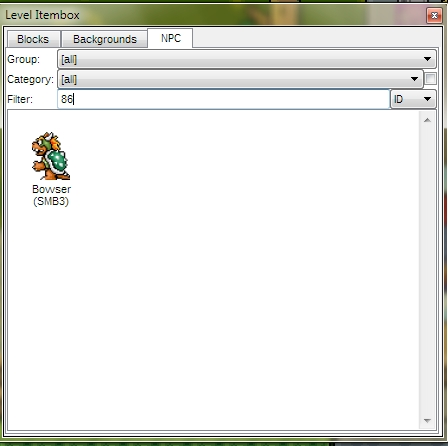 - Added message box event creator for blocks context menu. - Fixed bug of events toolbox when changing language. 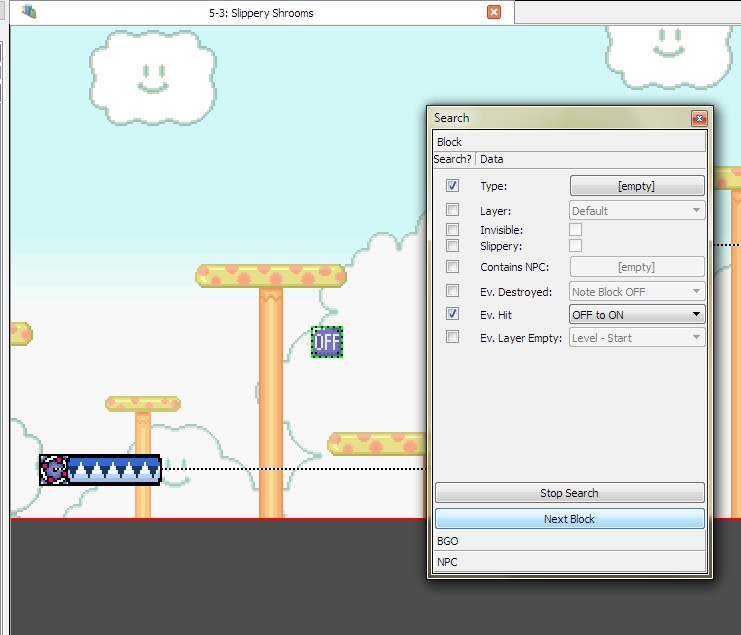 - Added "Transform all Item-ID into" context menu feature which works like "swap blocks" in the SMBX. 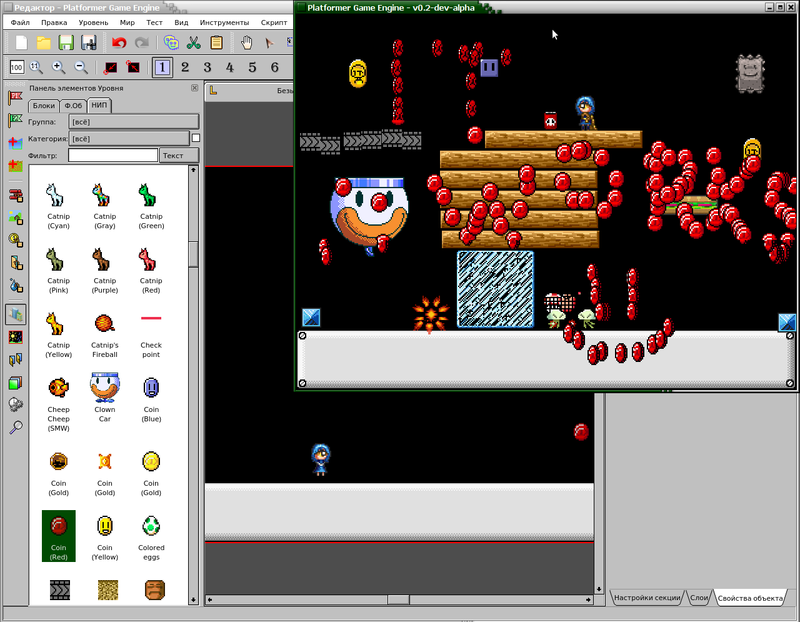 - Fixed crash on wrong log path, added log rotation on each start-up of editor like made in the engine. 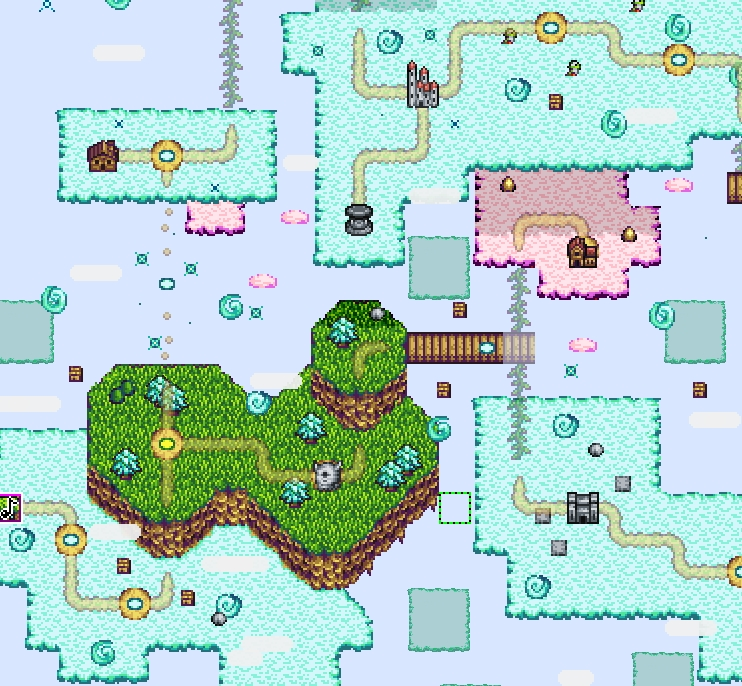 - Added testing of world maps! 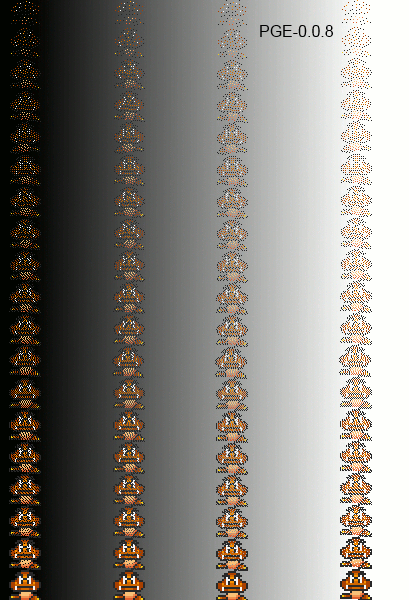 In this version fixed a lots of bugs and imperfections. 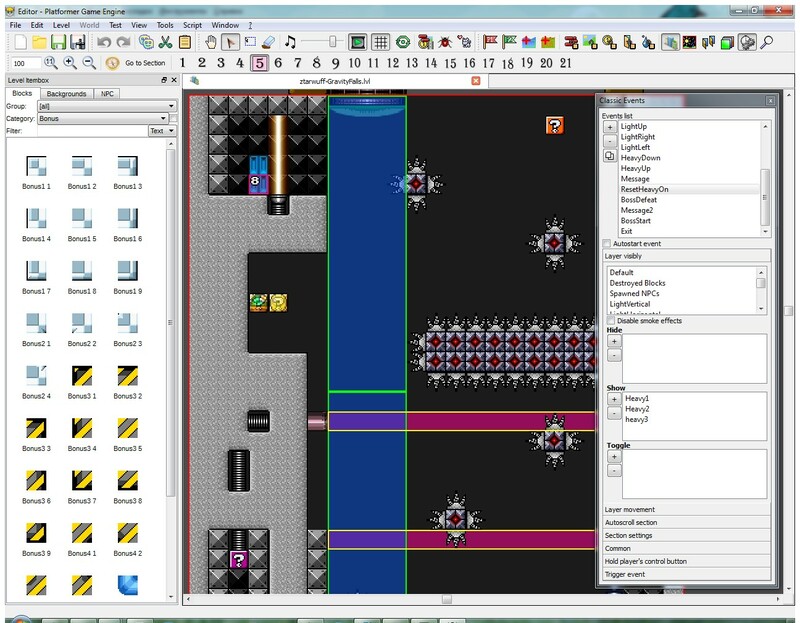 Now you can work in the PGE Editor More convenient! 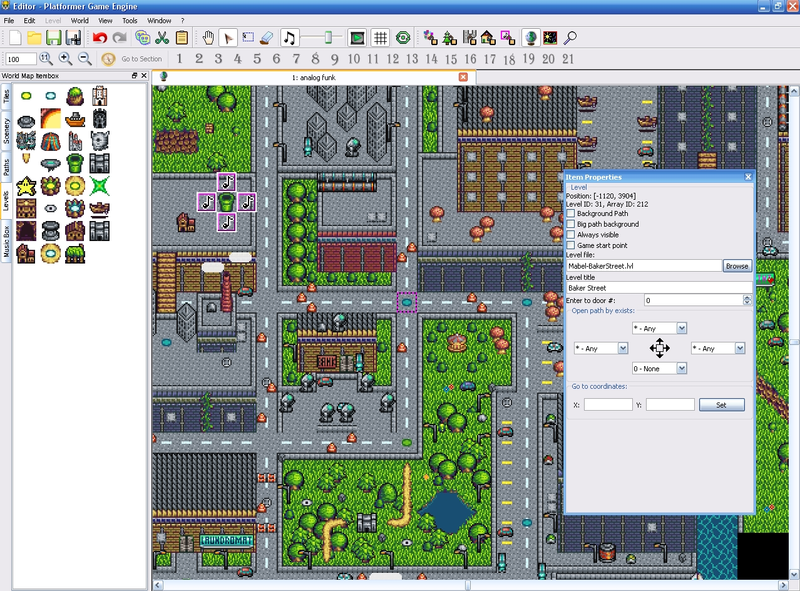 - Added able to use line tool for NPC's. 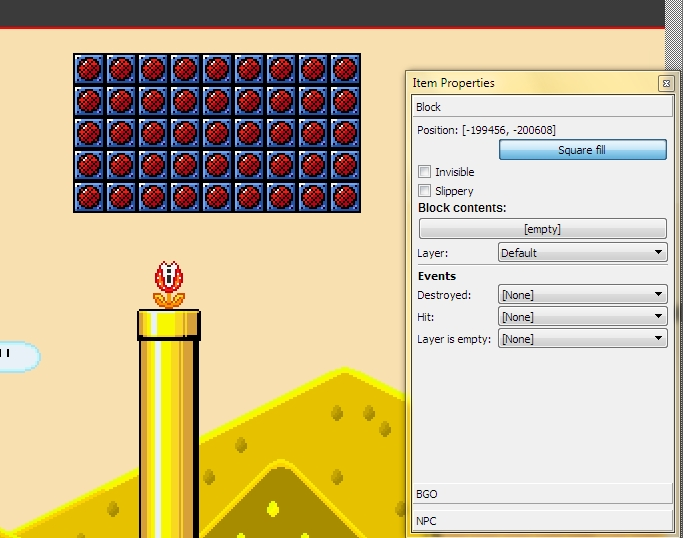 - Added layar movement speed calculator which will help you calculate speed in blocks per seconds. 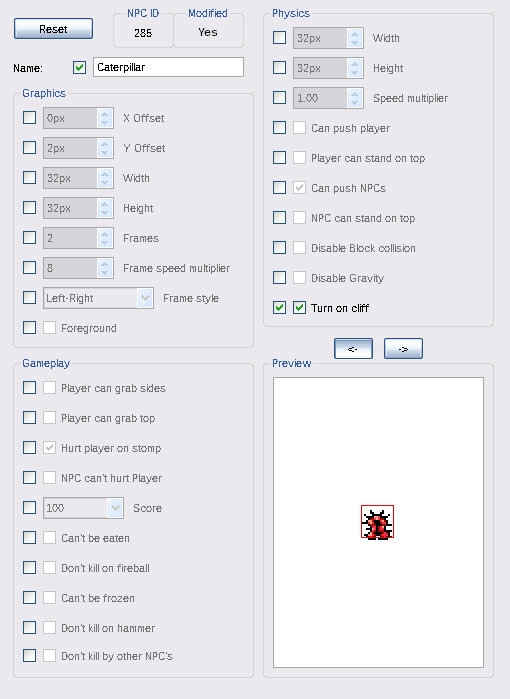 - Added reading of SAV files which show game save statistics in the editor. 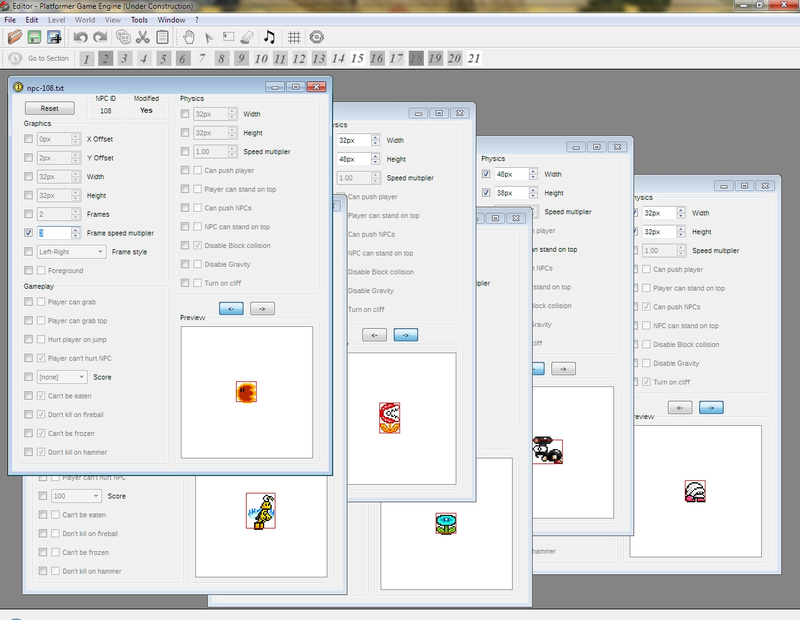 - Better resizer boxes, now they are movable and more flexible, added context menu to cut size by any side. 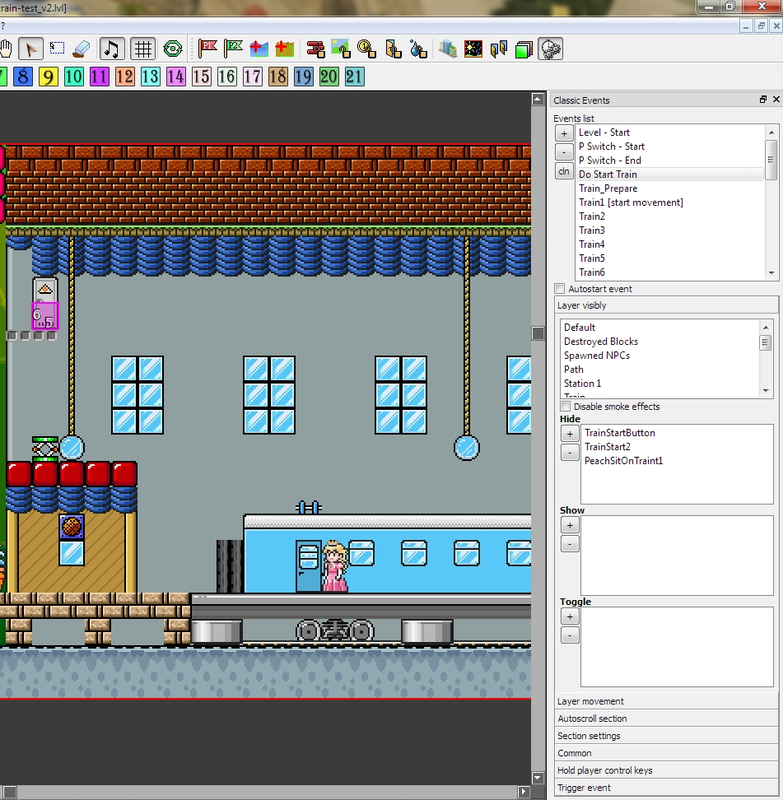 - Added custom counters which giving able to count any specific item ID's. 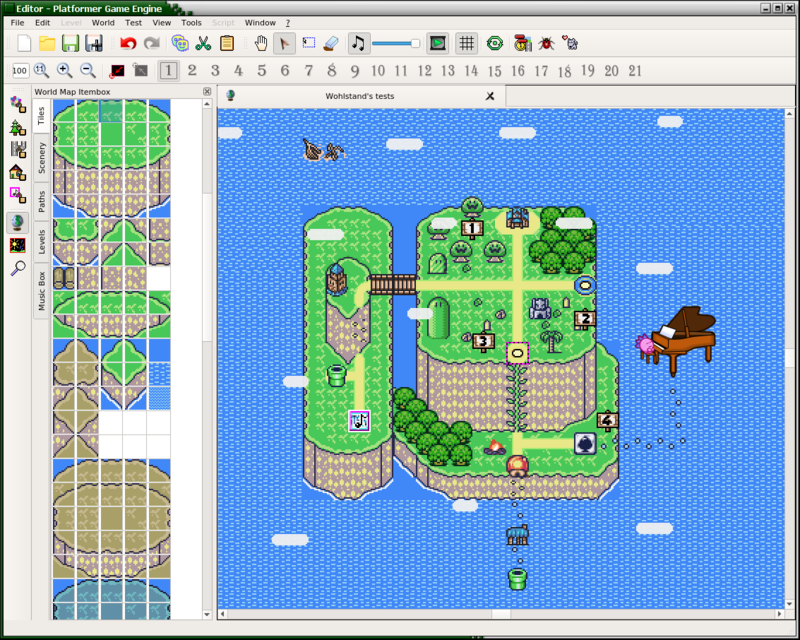 After some bug fixing works, we can say: It is a first stable version of alternate editor for SMBX! 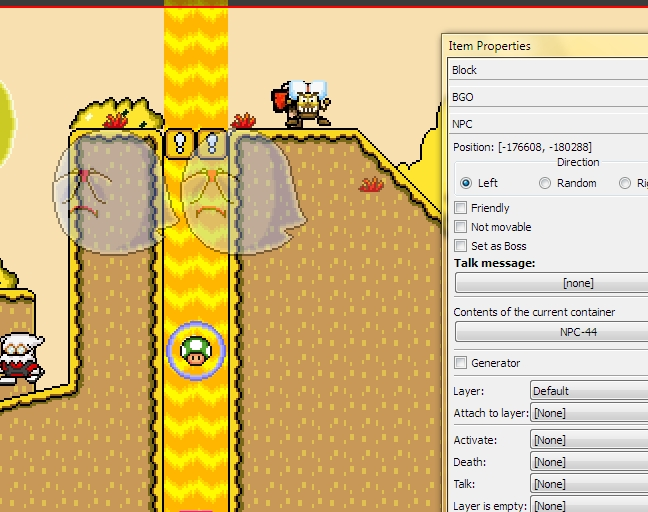 Fixed artifacts bugs, fixed multi-line messages of NPC's which allow to use "NewLine" character instead of extra spaces, etc. 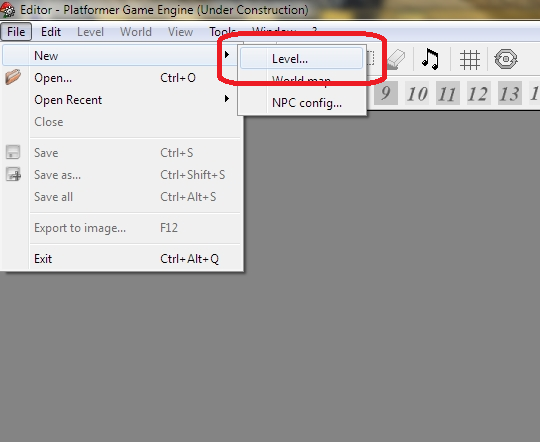 We already started the development of engine counterpart and with them will be available internal level testing. 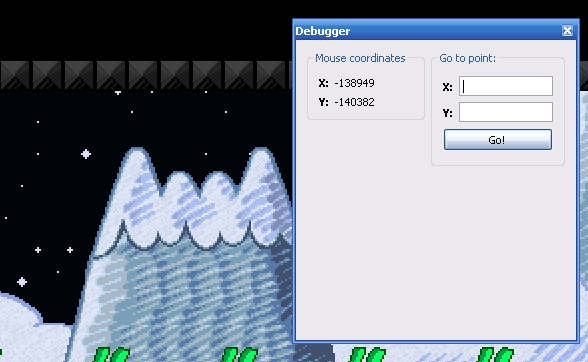 Fixed artifacts and displaying of target layer in placing mode was improved! This is mainly a bug fix and optimization update. 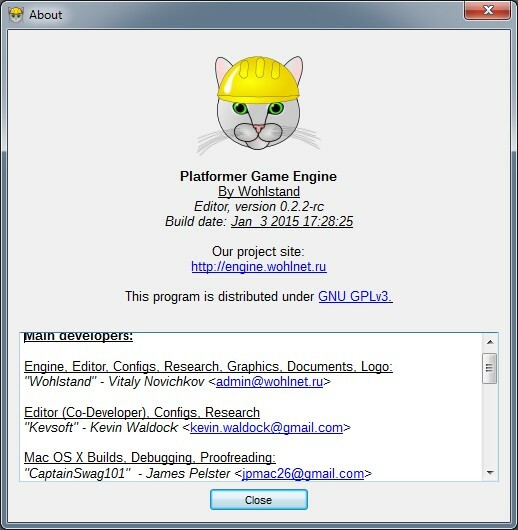 Also, we have great news: we are ready to start development of the PGE engine counterpart! 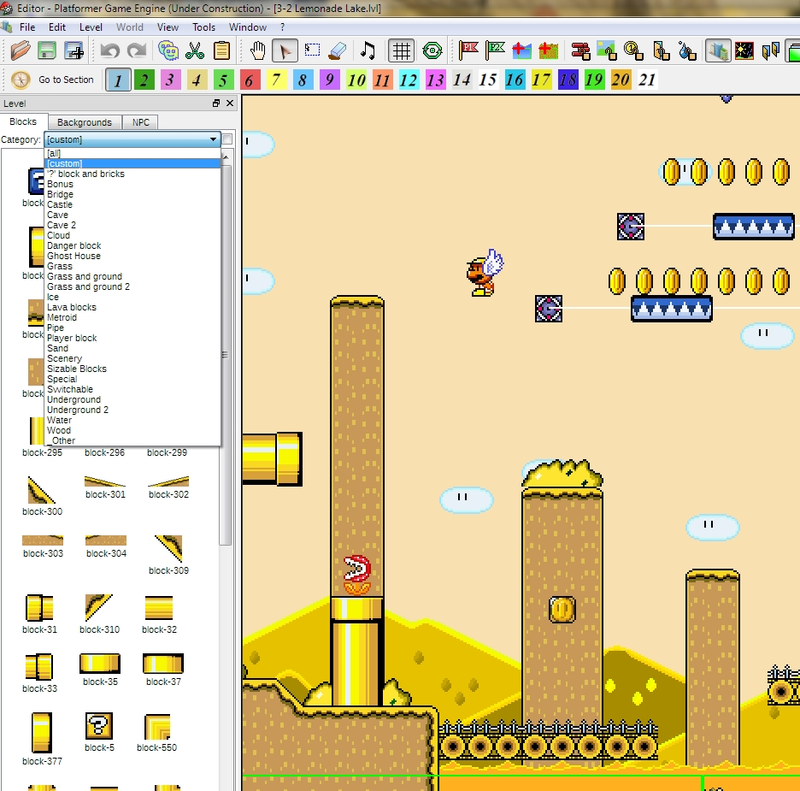 New features will be added into the editor during the engine development process, including: a cross-process module which will allow level/world testing from the editor without using SMBX, and many other useful features! 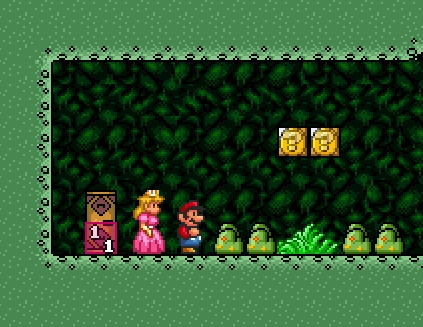 - Added SMBX64 standard validator which prevents you from saving a file that would cause SMBX to crash, such as exceeding SMBX's maximum level size, etc. 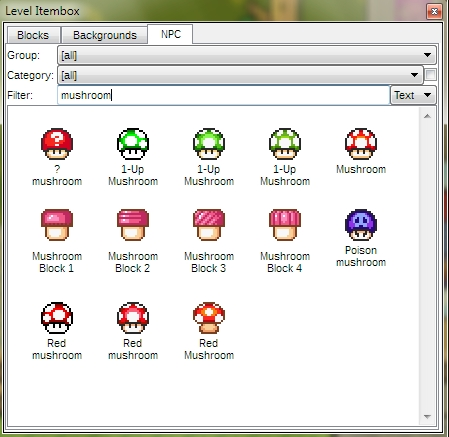 - Added support for a Themes system. 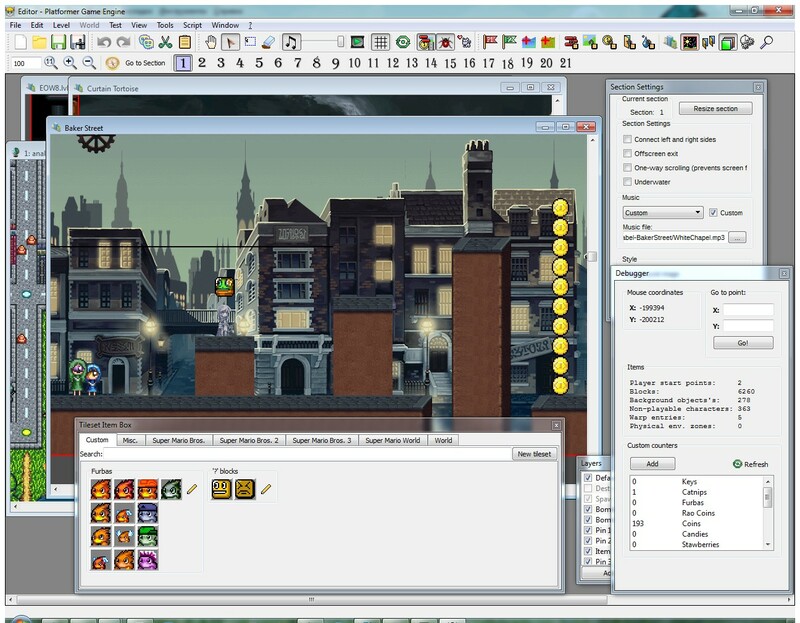 You can customize the UI and GFX of editor on your own! 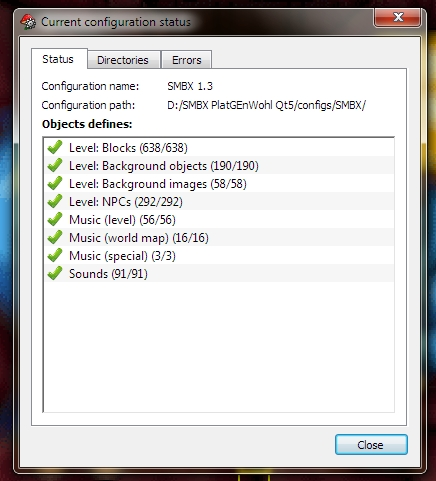 LVLX - the future successor of SMBX LVL format. 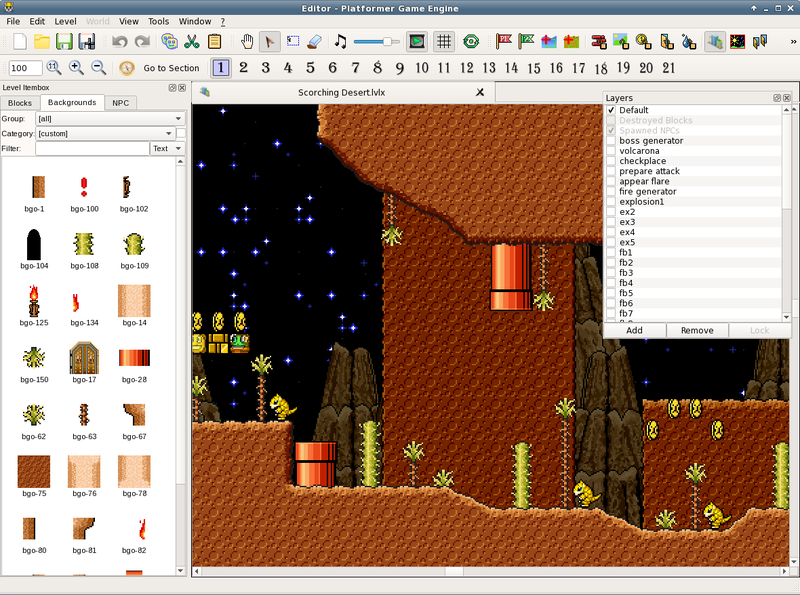 The LVLX file format is flexible and will always be backwards-compatible (can be opened in old versions of the PGE editor). each value has its own marker/header which connects the data field with its array variable, you can even create new data fields or exclude unnecessary fields (unknown fields/markers are ignored, undefined fields/markers are set to their default values). equal to default or unused data is never written into the file, which reduces its size to about half the size of a LVL file, even with data-markers. 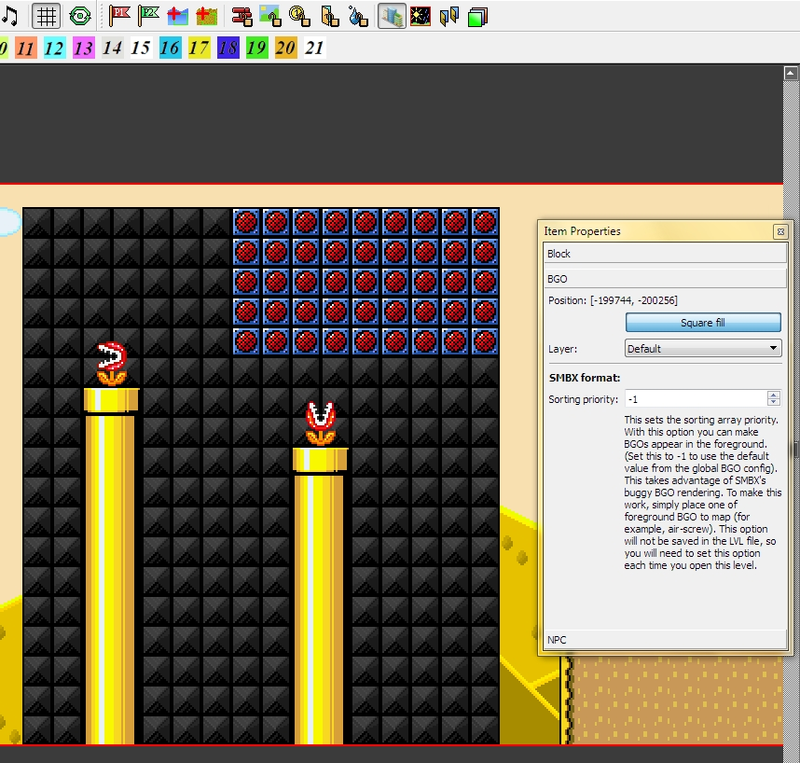 The PGE editor is now officially in the Beta stage! 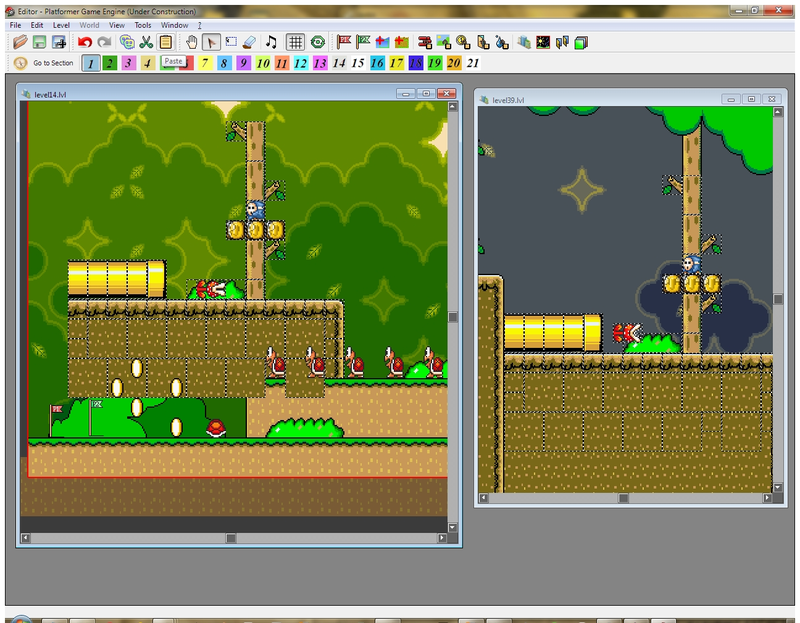 The editor now completely supports the SMBX standard, and can edit any level, NPC, or world map. 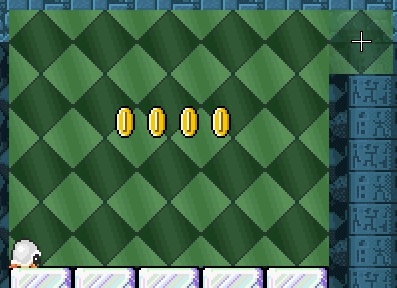 - Invisible frames of some items are now visible! 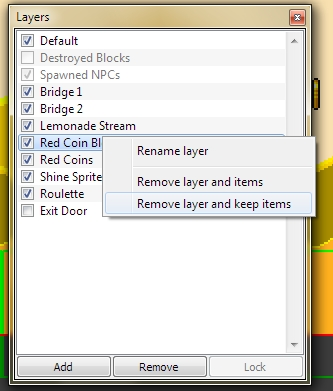 - Improved LVL parser: ordering/layering format <10 will automatically set BGO sorting priority for BGO 65 and boss flag for NPC-15, 39 and 86. 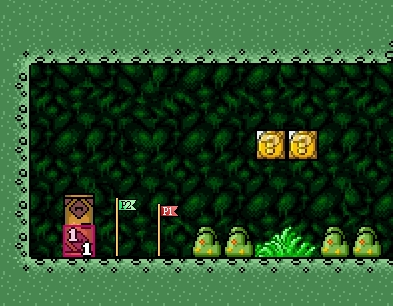 - Added point selection dialog. 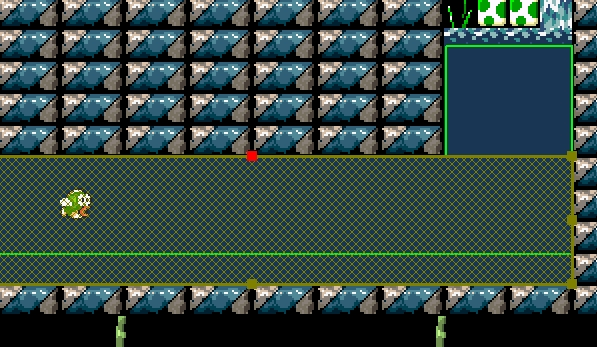 You can select a point from a world map directly to the warp on the level. 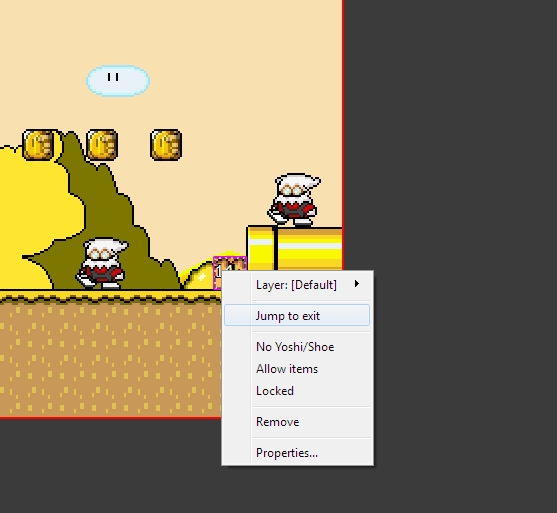 - Mouse control for level editing workspace was improved. 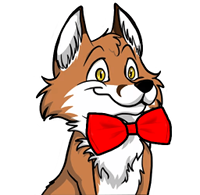 Fixed a lot of bugs and fixed context menus on Linux systems. 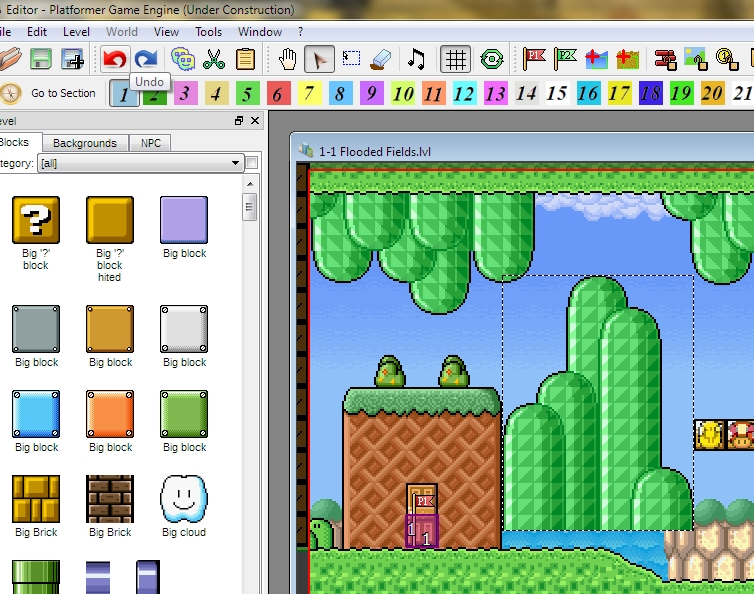 - The drawing algorithm for sizable blocks has been improved: Sizable blocks will be displayed correctly in any size. 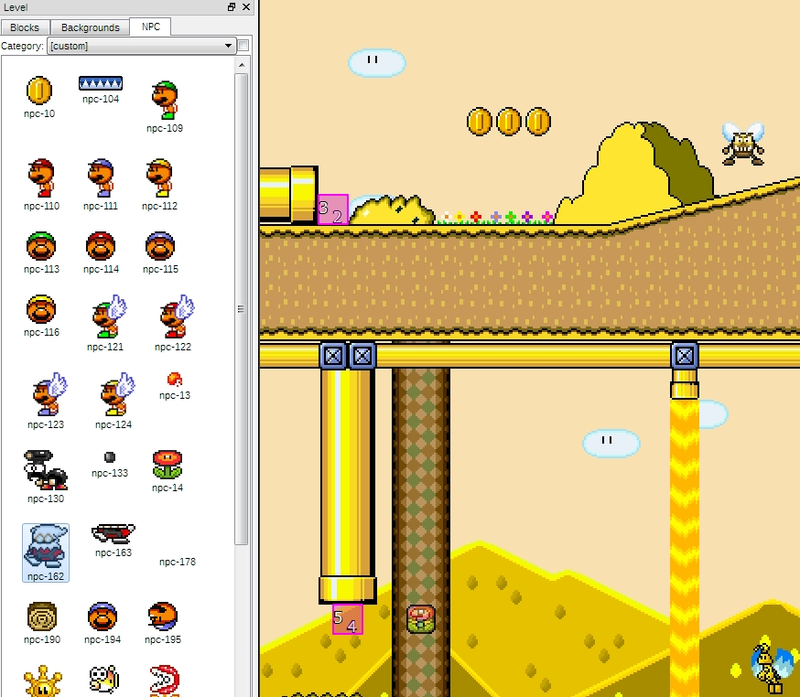 - Added zoom support by mouse-wheel and ALT key. 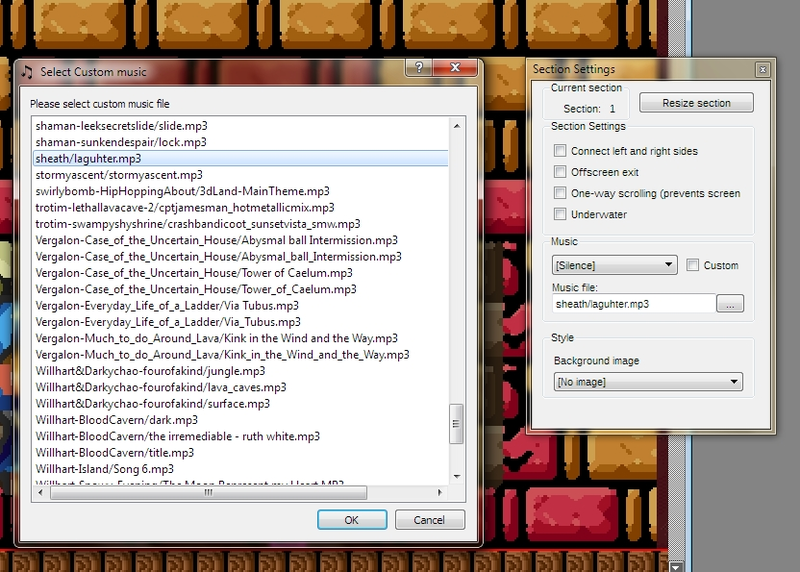 - Background-selecting list now has thumbnails for previewing! 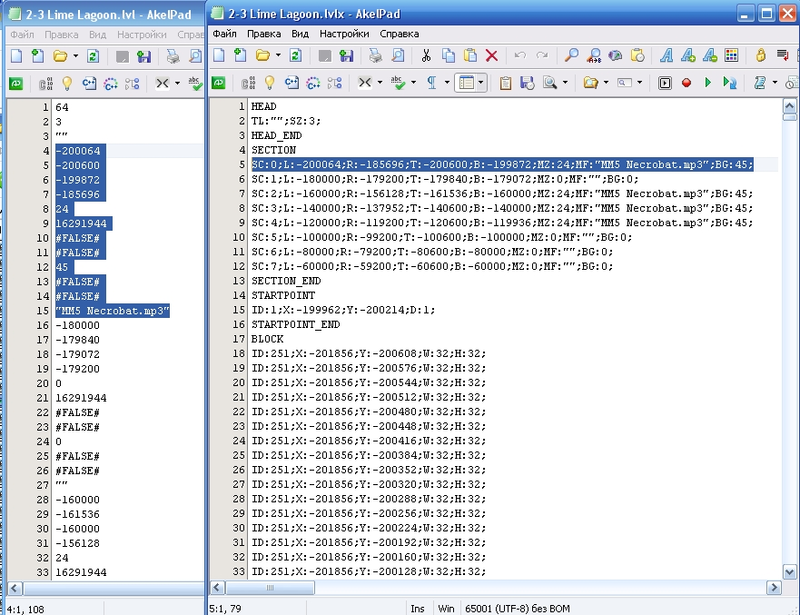 You can switch between different configurations and data packs, which is very organized and convenient. 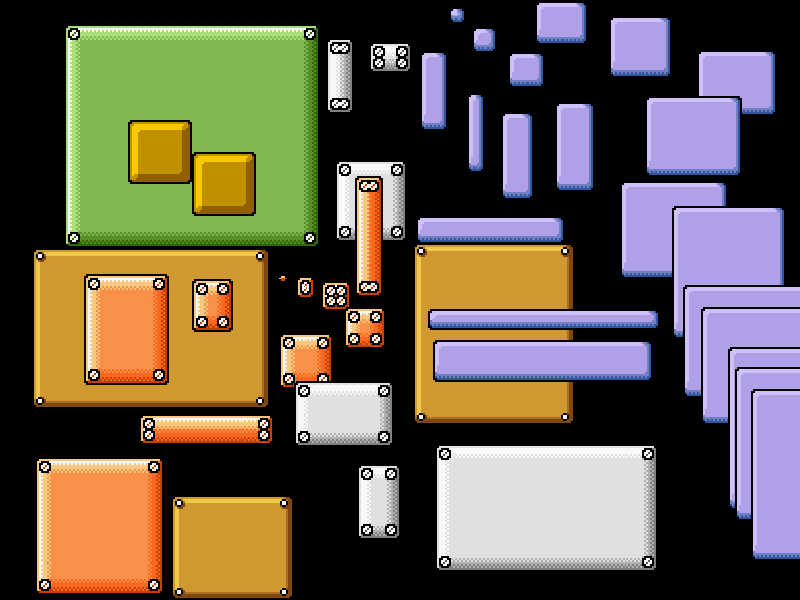 Each configuration pack can contain its own music, graphics, sound effects, NPCs, etc. This is perfect for working on many different projects and episodes. with the ability to use ANY image with ANY size! 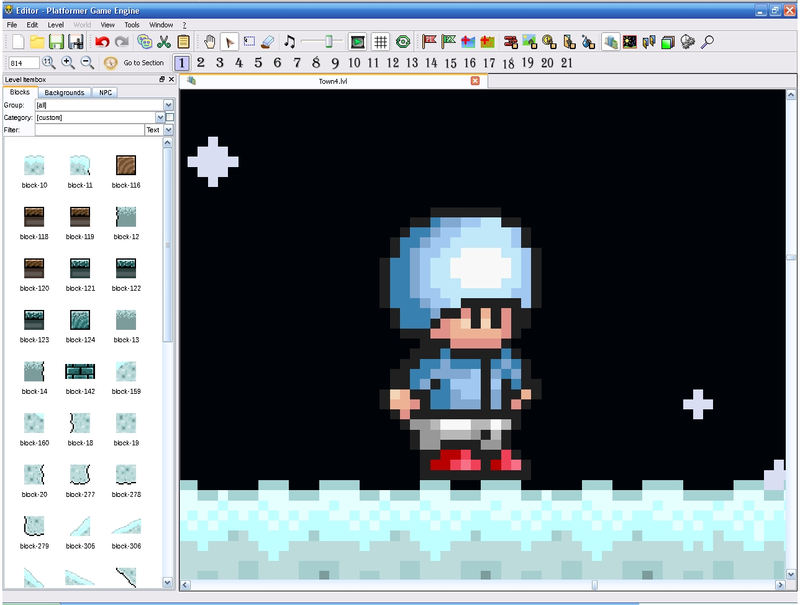 Fixed a lot of bugs with animation, and animator will now accurately and correctly render custom NPCs. 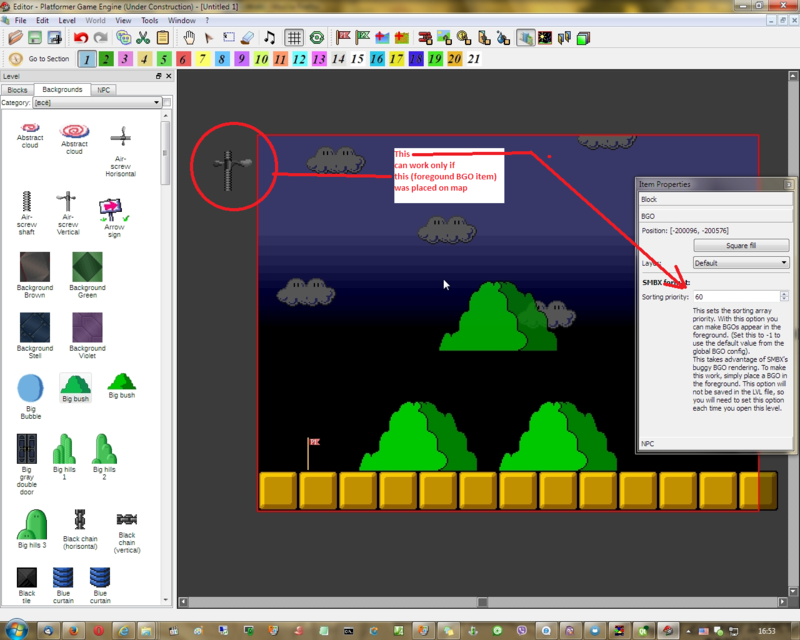 Additionally, you can define the name of your custom NPC, which will be displayed in the editor. 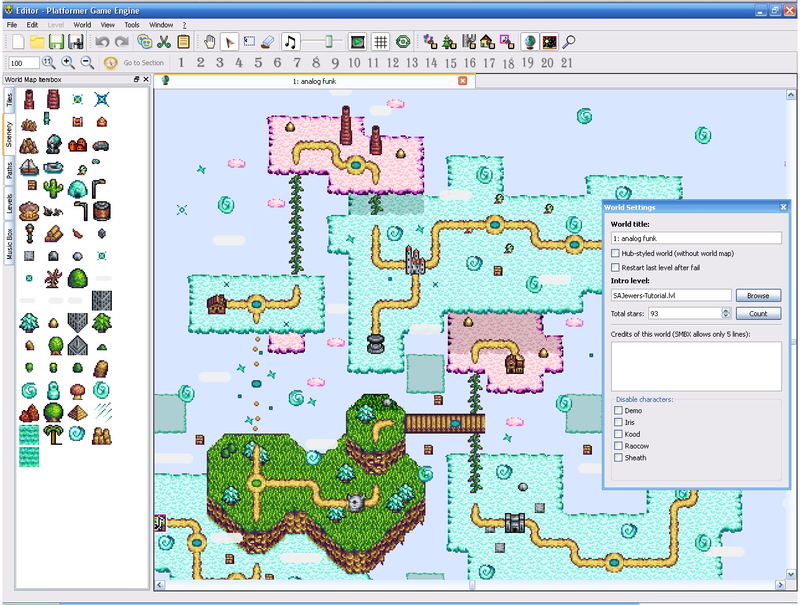 The editor features an editable and flexible tileset item box, you have the freedom to edit anything! 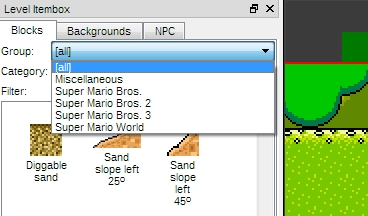 Draw slopes, bridges, and walls easier! Draw over everything! 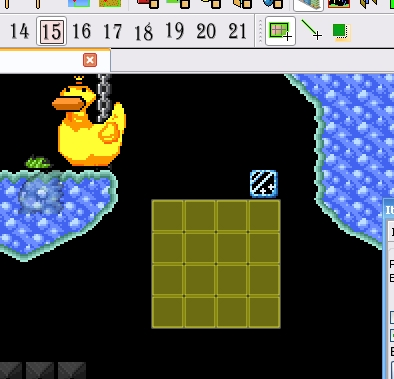 With overwrite mode, you have the powerful ability to draw/place items over all objects in the same location. 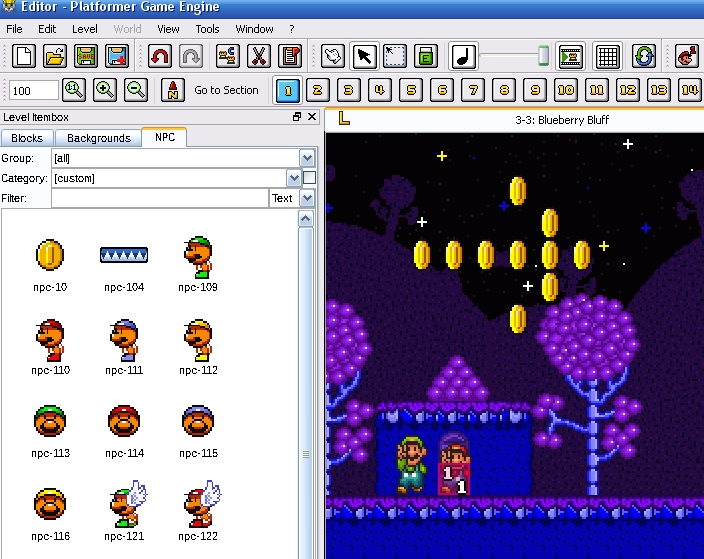 All console tools have GUI executables which will help you use these tools easier! 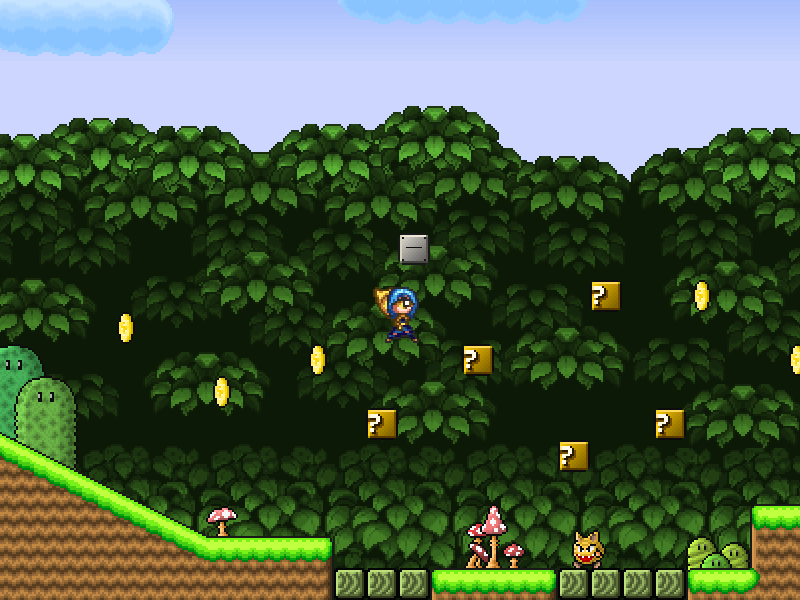 Your sizable blocks can have ANY size, even sizes that are not multiples of 32, which would cause glitches in SMBX. 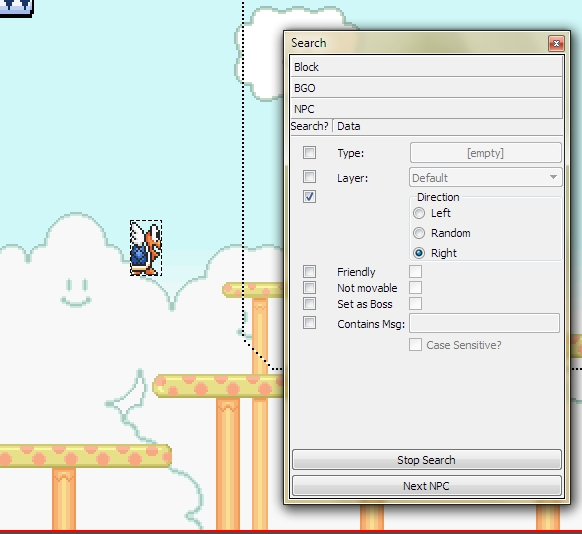 You can see your current mouse position, jump to any position on the map/level, and much more! 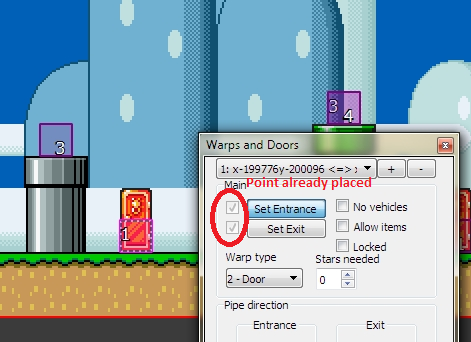 If you want to create a warp from a level into the world map, you can grab a point from the world map easily and directly! 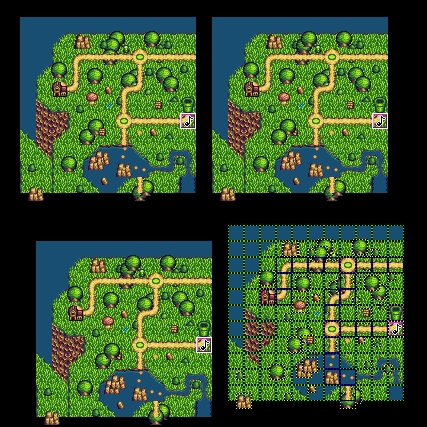 See, you don't need to manually enter map coordinates any more! Now, you can simply click a point on the world map. 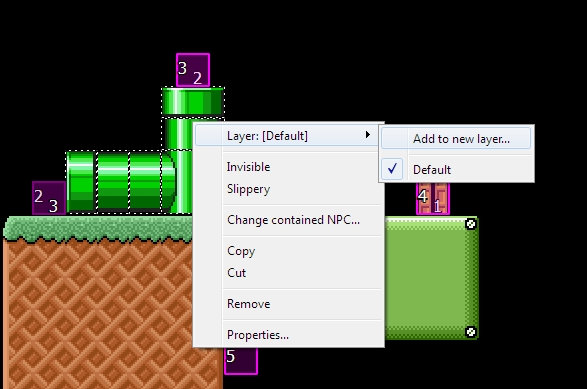 A useful feature to place items more accurately in the "no grid snap" mode, or to view the whole map at once without needing to export it into an image! This is a bug fix update with some improvements. 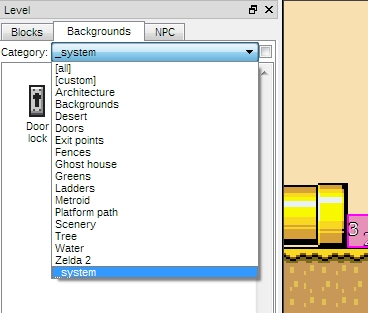 - Added displaying of Item ID in Properties tool box. 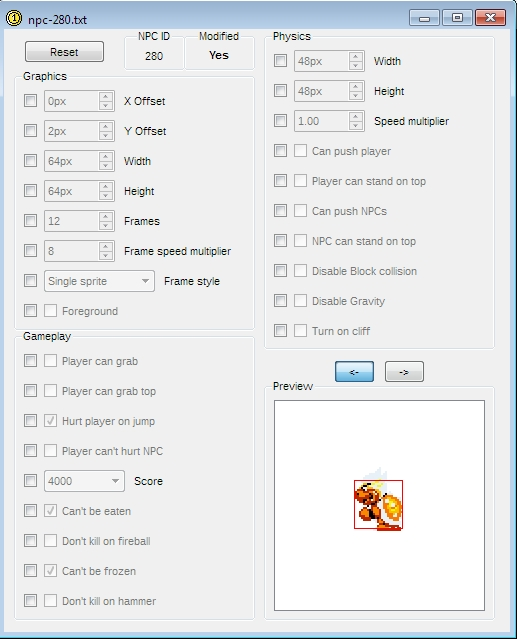 - Added fullscreen option, recommended for tablets! 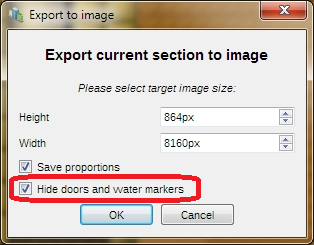 - Added option to Hide warps/doors and waters (Physical Environment zones) on exporting images. 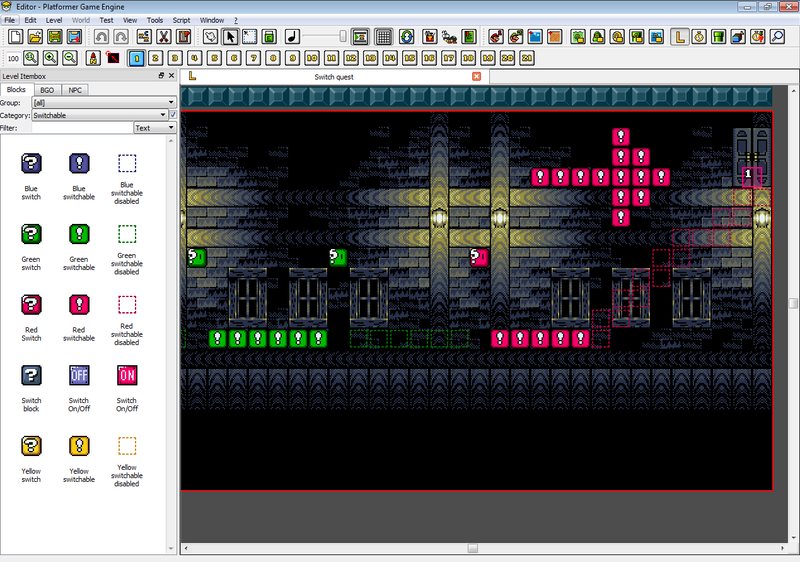 Each level has it's own title. 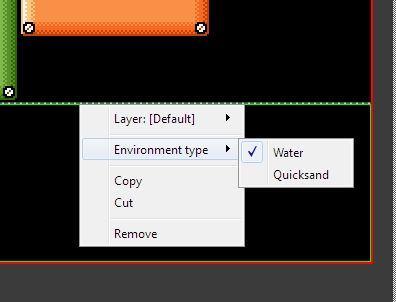 Now the title is displayed as the window title instead of the file name. 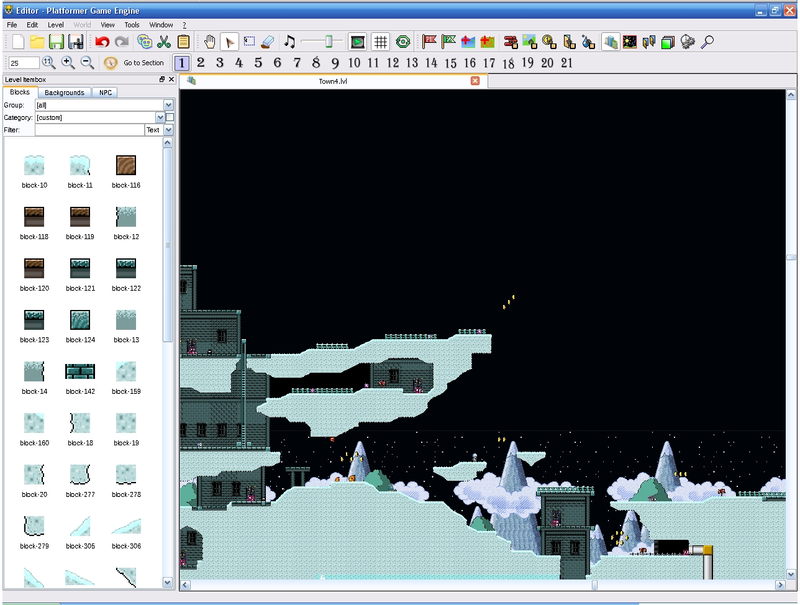 Here already realized all level editing features, even events, and fixed a lot of bugs. 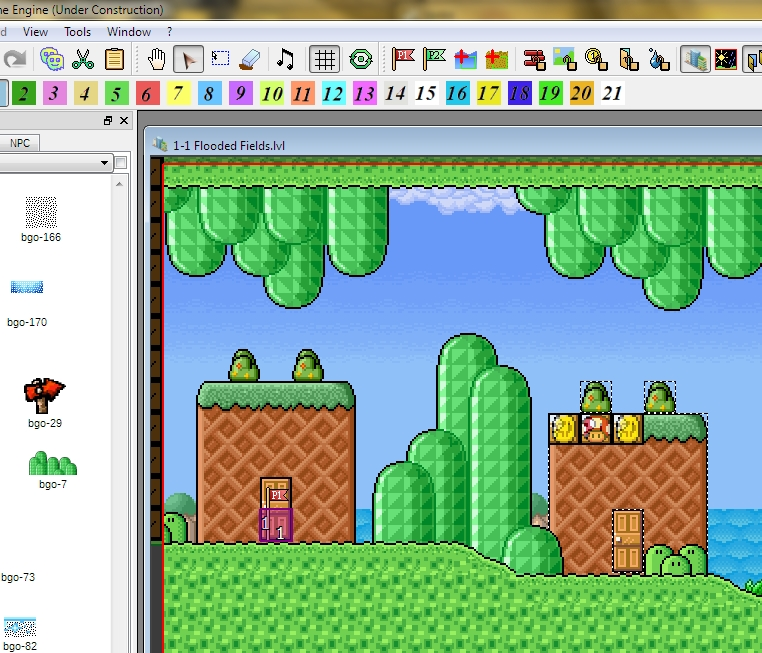 - Added support for BMP Files, Ghosties will be appeared ONLY if image really broken. 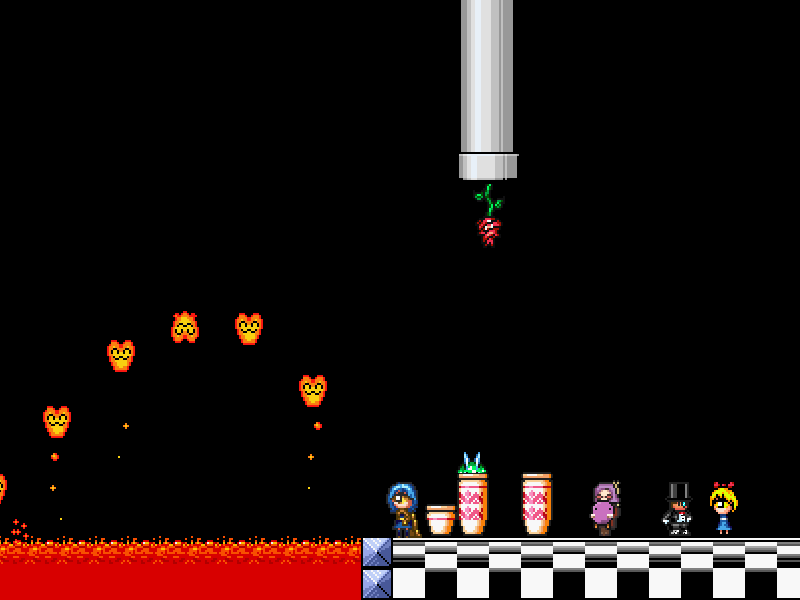 - Fixed bug with wrong background on created levels (before save them). 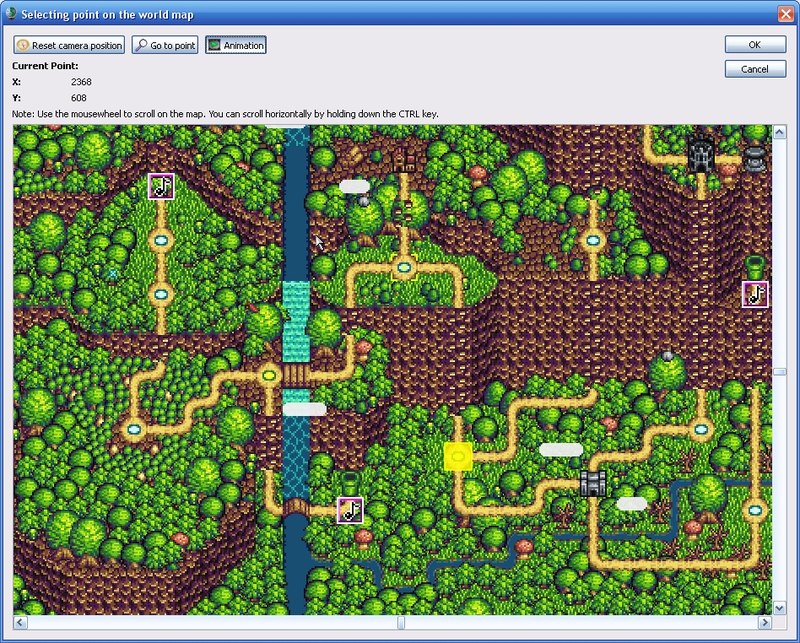 - Fixed bug with custom music paths after save new file. 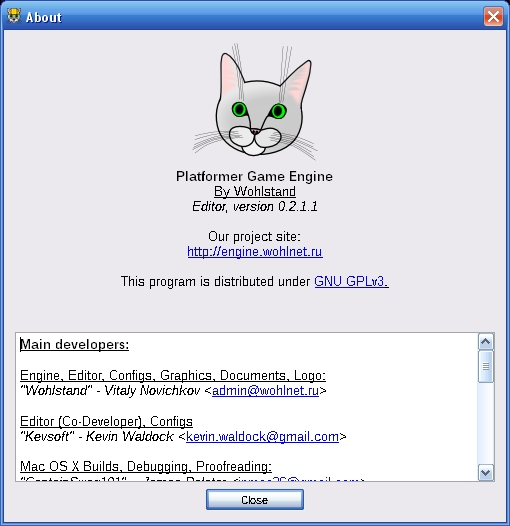 This utility converting all graphics from folder. 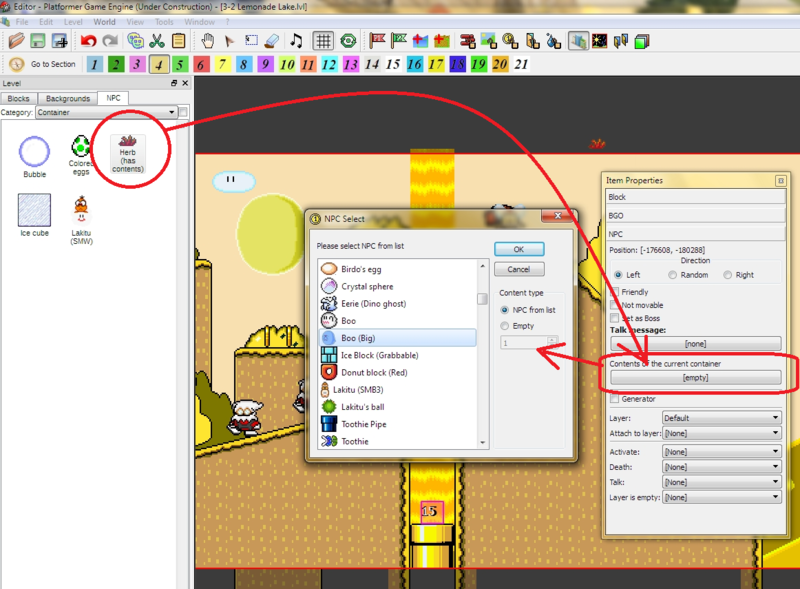 For take PNG with transparent, you need place AND source images, AND his masks into same folder. 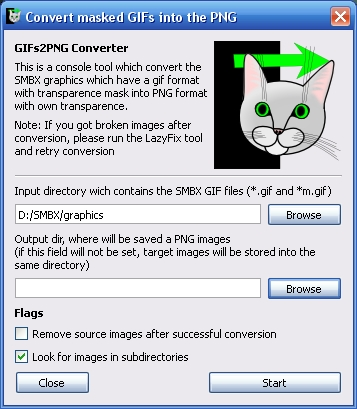 All gifs must be converted from BMP by second tool, if some images didn't read. 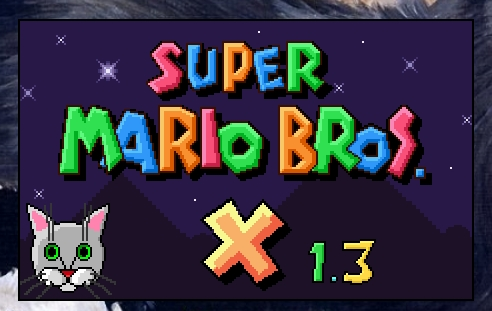 Where C:\SMBX\worlds\episode1\level3 - the path to your GIFs in SMBX64 format (with masks), what you want convert to PNG. 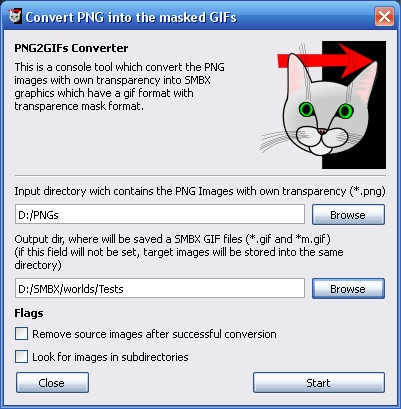 convert all BMPs into GIF format, made correct mask, what created by lazy work. 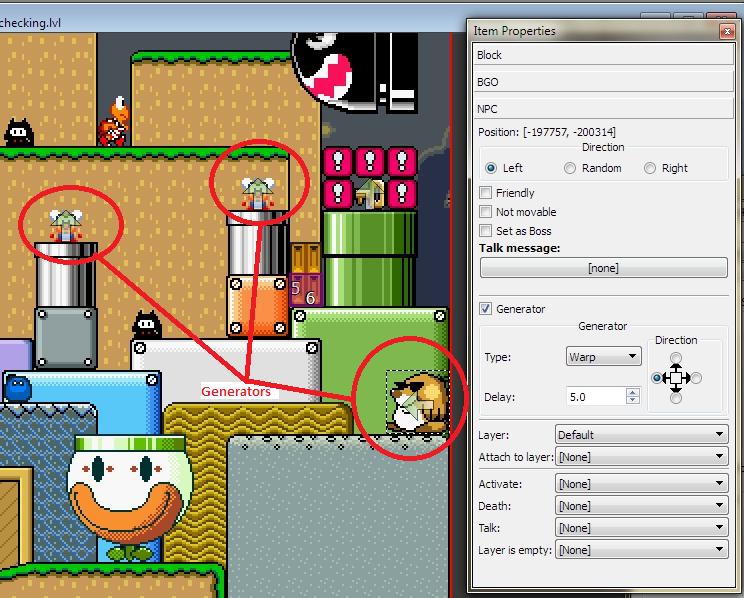 Utility can fix all GFXes of whole episode in one run!!! Note: this utility makes backups of your current graphics into "_backup" sub-folder. 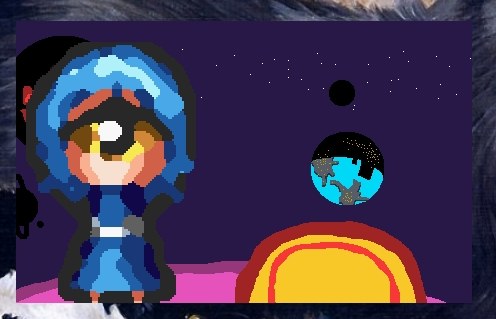 If you will find glitch, you can restore old graphics back. 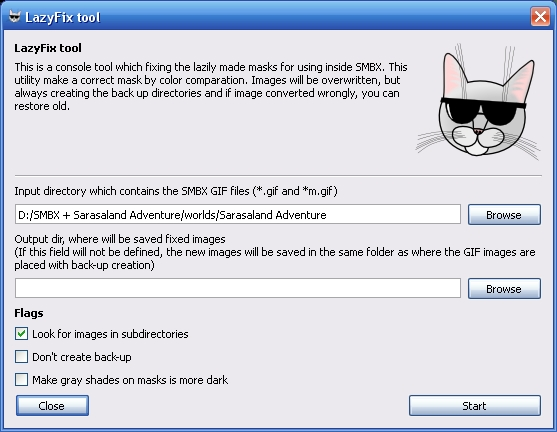 This utility fixing all SMBX64 graphics (GIF with mask images) in selected folder and (optionaly) all graphics insided into subfolders. 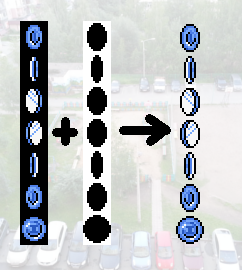 Mask must be placed WITH its image, fixing process based on calculating broken pixels by comparing between pixels of both images. 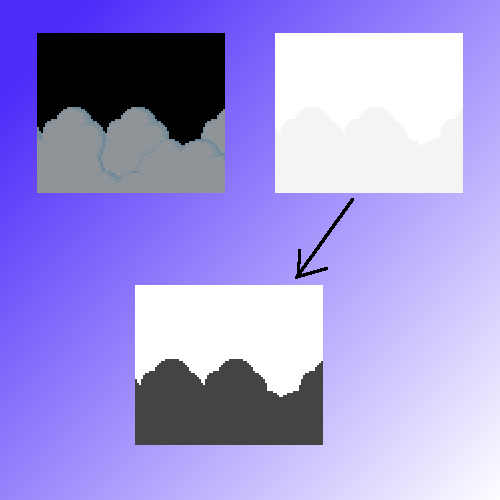 Where -G - switch for made gray color darker. Where -W - switch for walk inside all subdirectories. 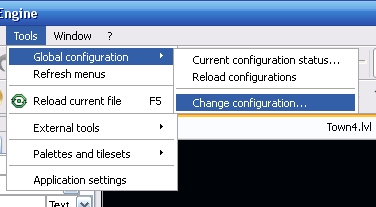 Where -N - switch for disable saving of backups. 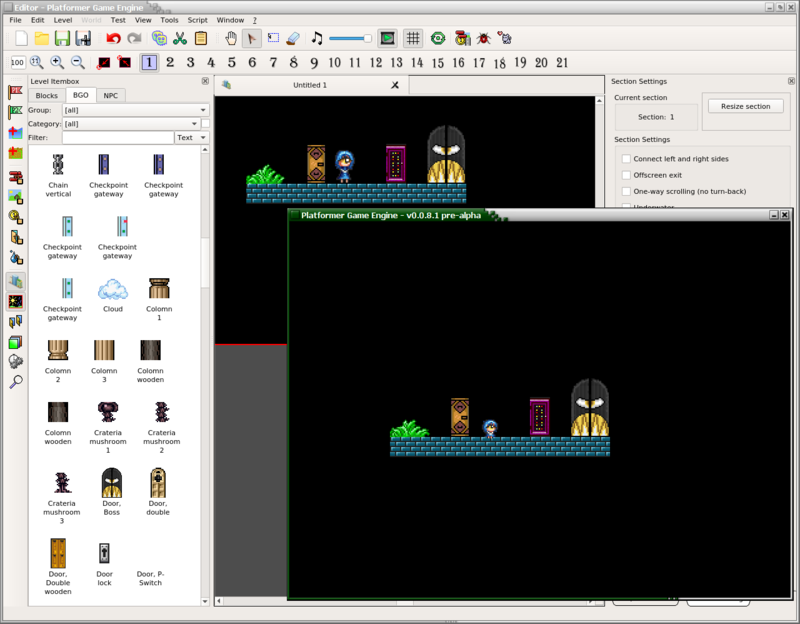 For Linux users: you can build yourself. 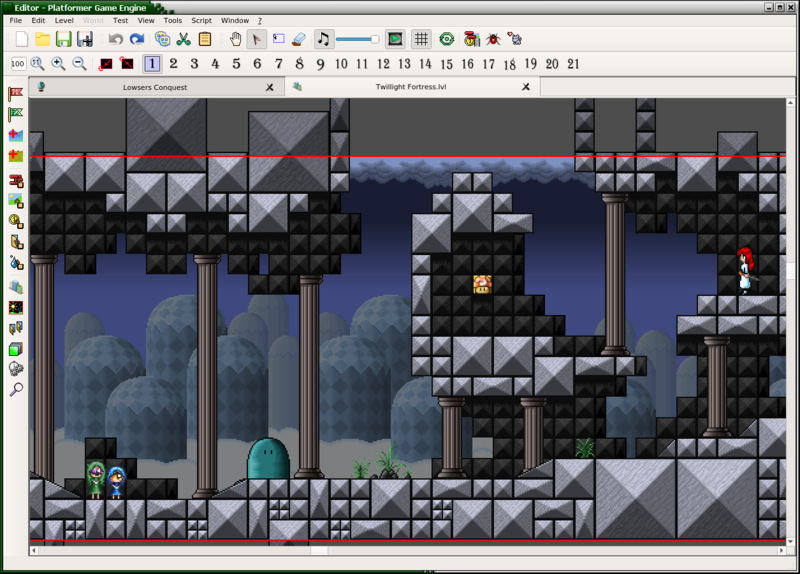 - POSSIBLE TO SAVE LEVEL FILE. 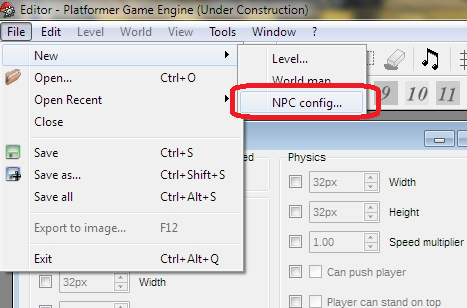 - POSSIBLE TO CREATE NEW LEVEL FILE, NPC.txt file with selecting of base NPC. - Clipboard: you can copy and paste. 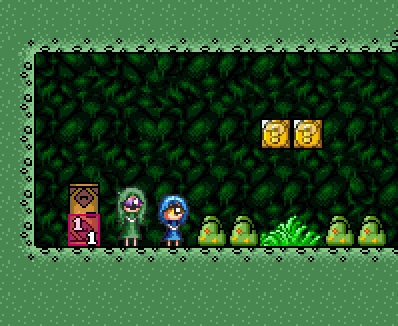 - Added Item Properties window, and with them possible to FULL CONTROL of ALL level items. - Added more protectors: you can violate limits with itemID and if itemID > global array item number, you will see dummy image instead crash. 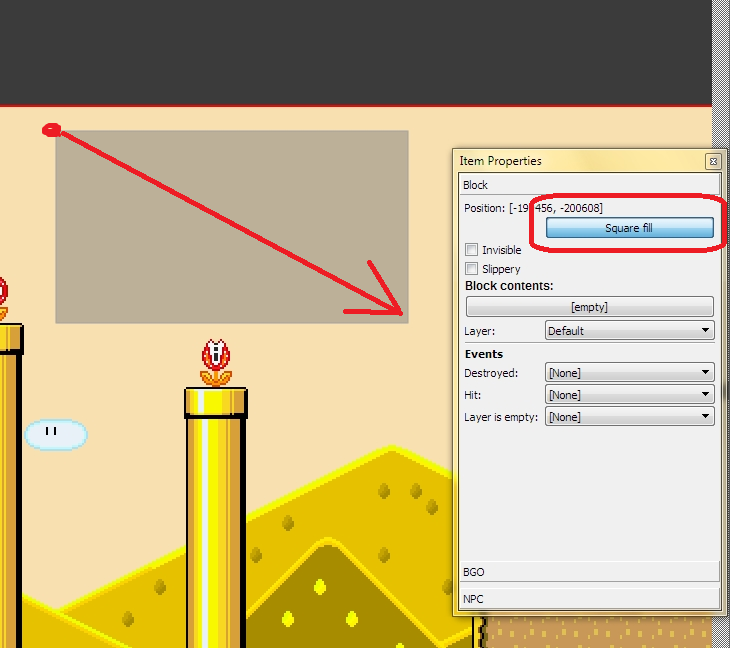 - Added "Selection only" tool, you can select item group without moving them. 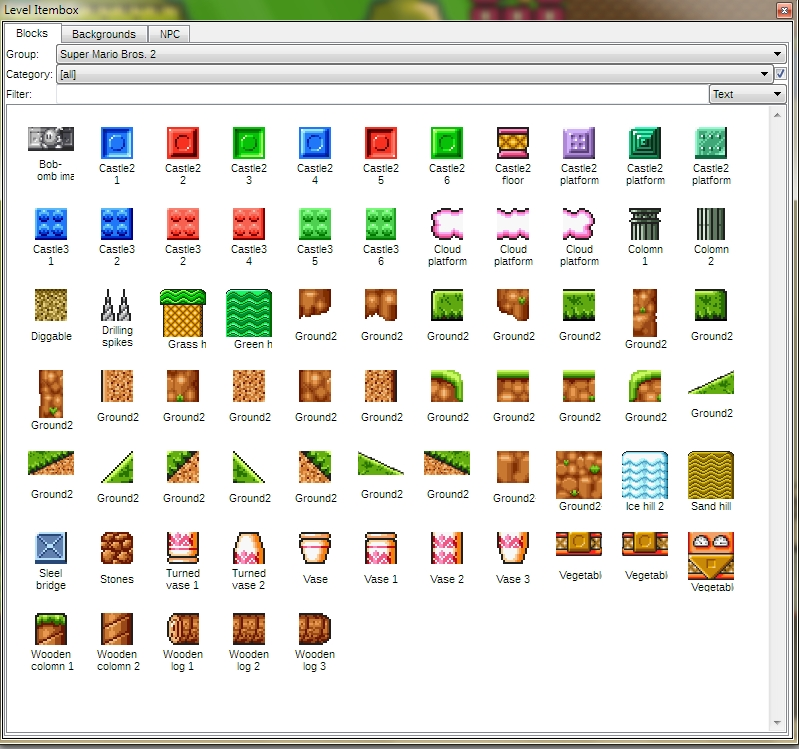 - Fixes in configs: almost sorted blocks, BGOs and NPCs. 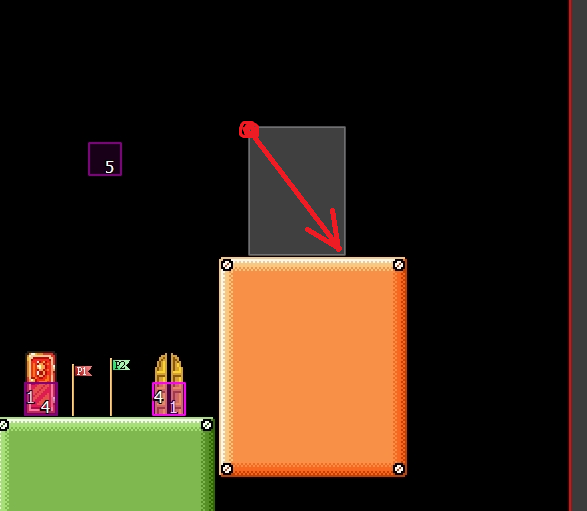 - "Goto entrance" and "Goto exit" - possible to fast find other side of door, even them placed in other section. 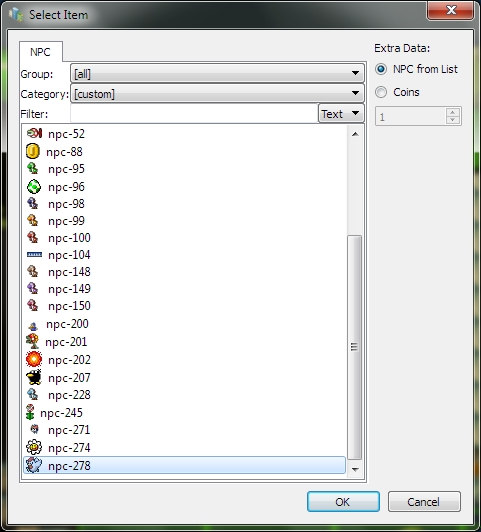 - in NPC-Editor displaying all default values for current npcID, if option not used. 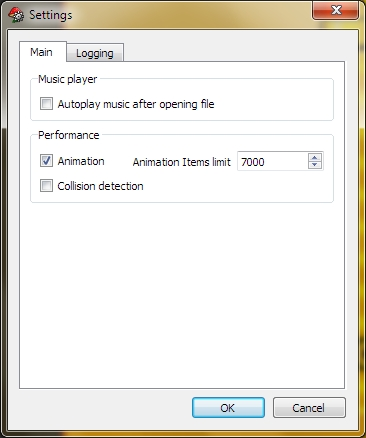 - Added application settings window: you can set autoplay music/animation/collisions or set log level and log file. - Animation will be reseted on exported image. 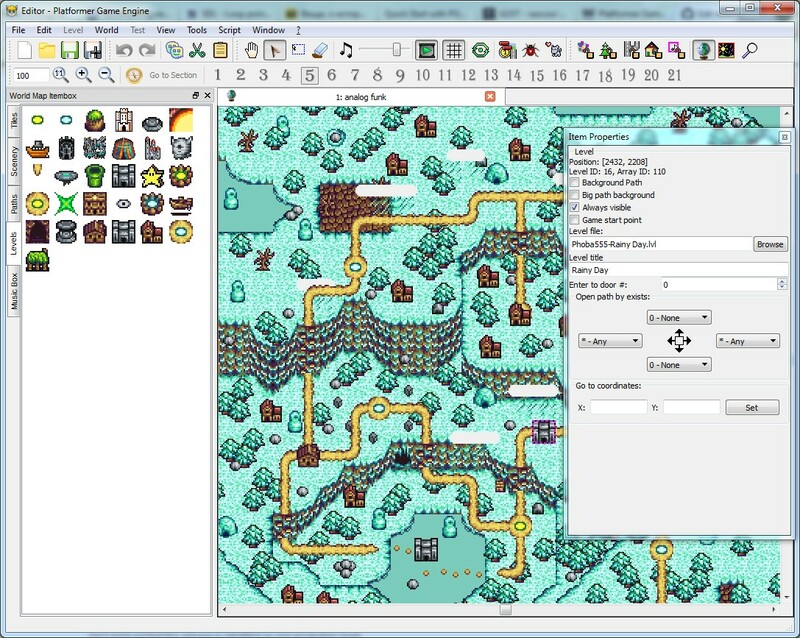 - Optimized item map controls. 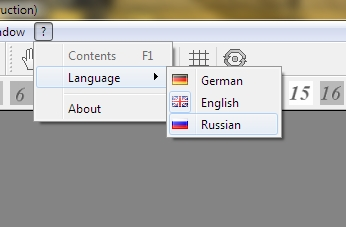 - Now, we have finished translates: English, Russian, German. Any of you can made more translates. 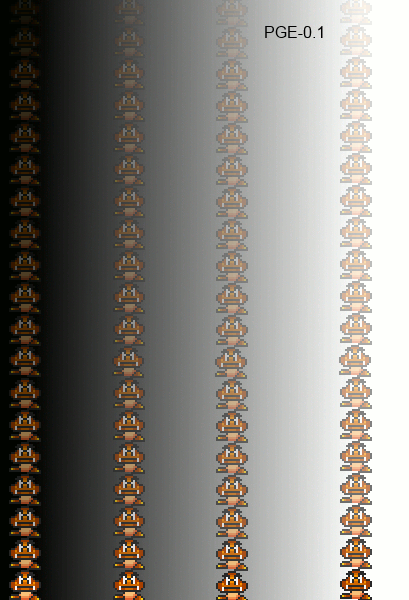 - Fixed bug with sets of containers to empty. 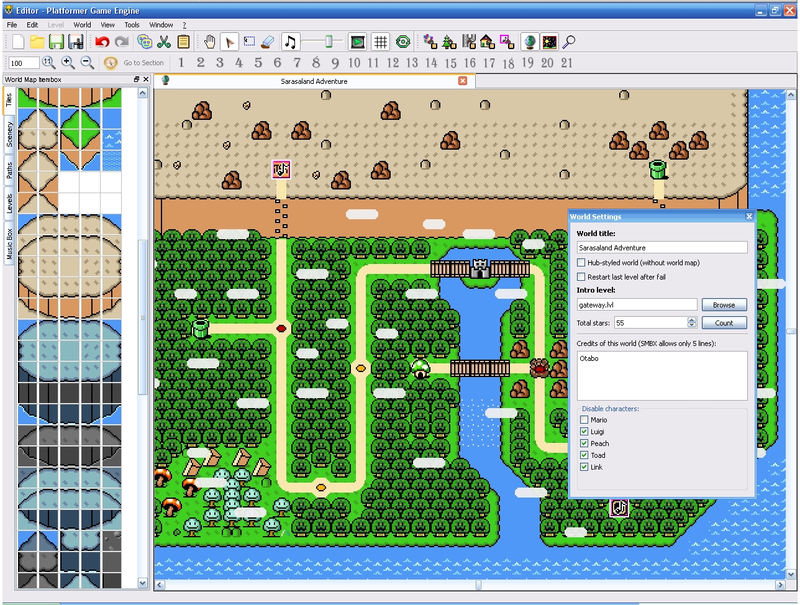 This version can control almost all SMBX level elements, but for now you can't edit and create events. 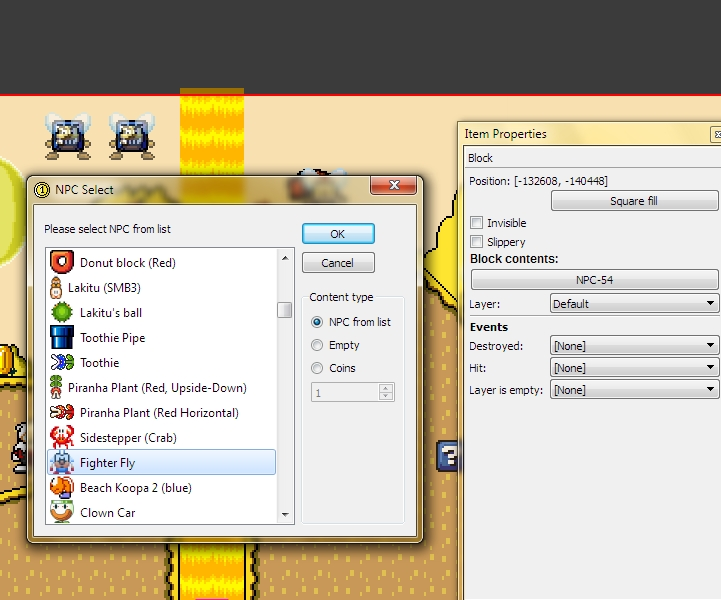 Events control will be implemented in next version. 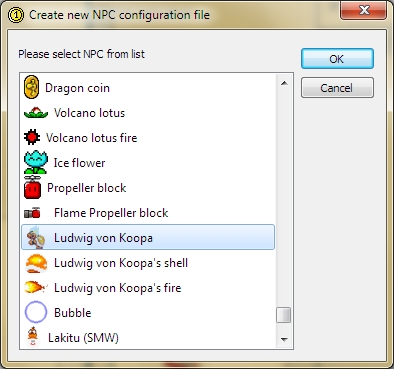 But already created events you can use in NPCs or on Blocks and save them. 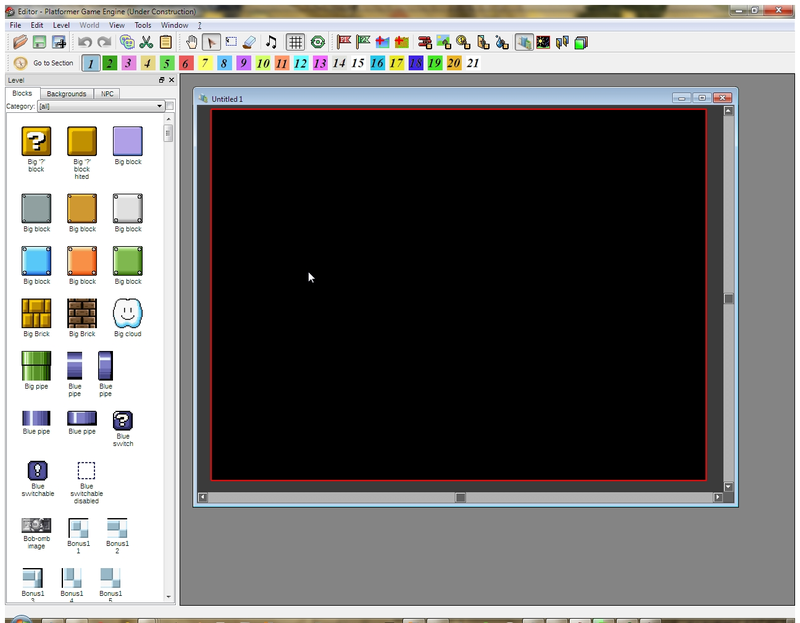 After resizing, press ENTER for accept resize or ESC for cancel resizing. 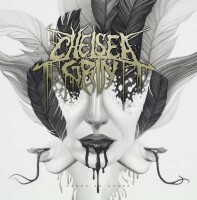 Now already translated to English, Russian and German. Last edited by Wohlstand on 4 Jan 2015, 20:45, edited 17 times in total. 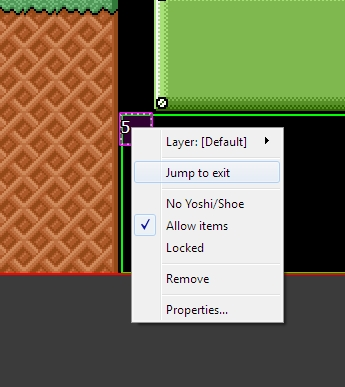 Out of curiosity, if we use content that was originally in SMBX 1.3, can the level be loaded back into SMBX after being loaded into here? 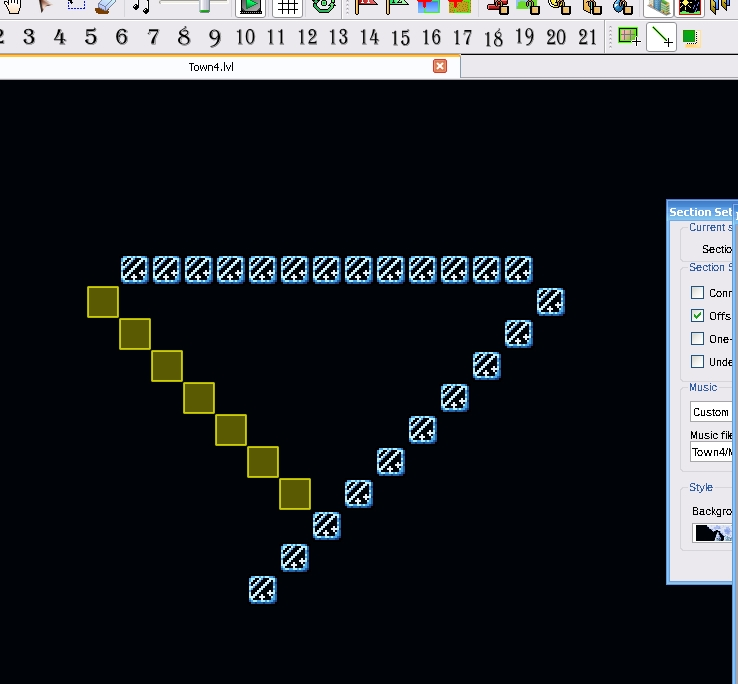 I'm really getting excited about this, will you add support for the editor to remember where you place the top toolbars? 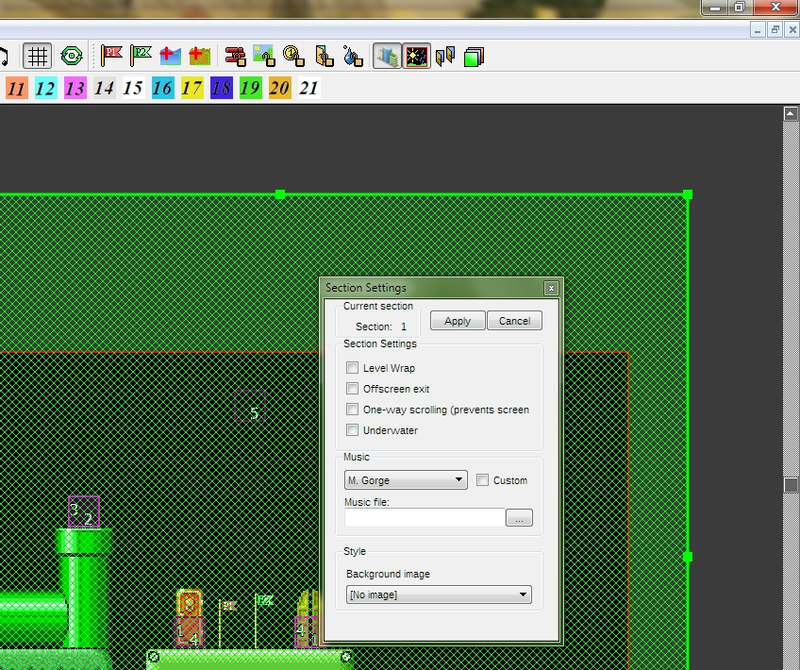 I like to move my sections toolbar up next to the open, save, etc buttons on my widescreen. 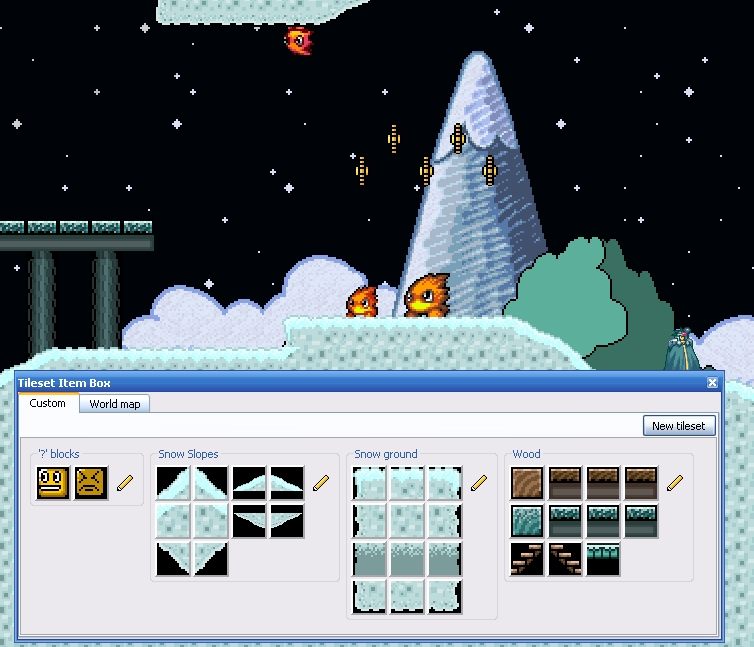 Luigifan2010 wrote: Out of curiosity, if we use content that was originally in SMBX 1.3, can the level be loaded back into SMBX after being loaded into here? 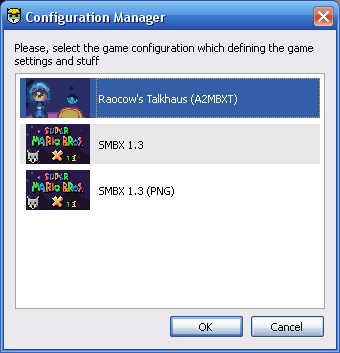 Yes, I will save 64th format for support saving file for SMBX 1.3. 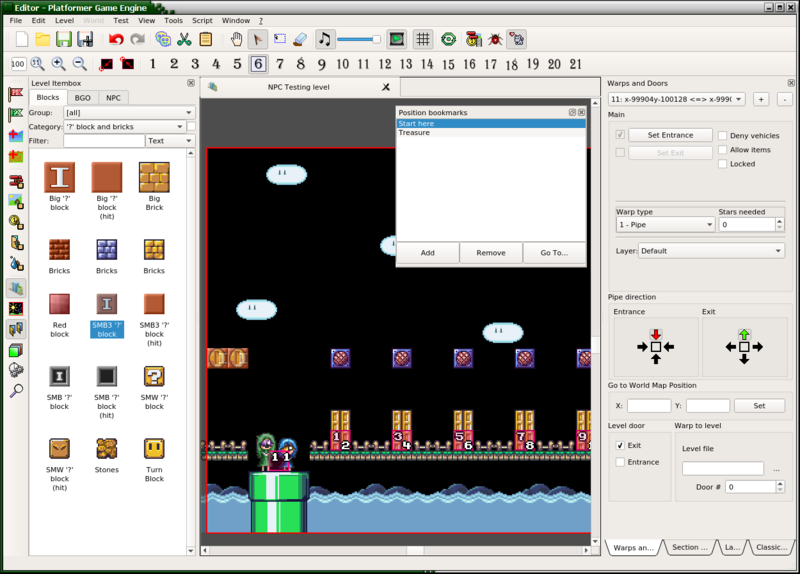 While I not add new file format functions (when I start developing engine, I will make new functions, and add new file format options, but, I will make select: save in new LVLX/WLDX format, or save in SMBX 1.3 LVL/WLD format with parameters less (using only parameters, supporting in SMBX 1.3)), now I will save in SMBX LVL-format. But just saving not working (dummy without writing). P.S. 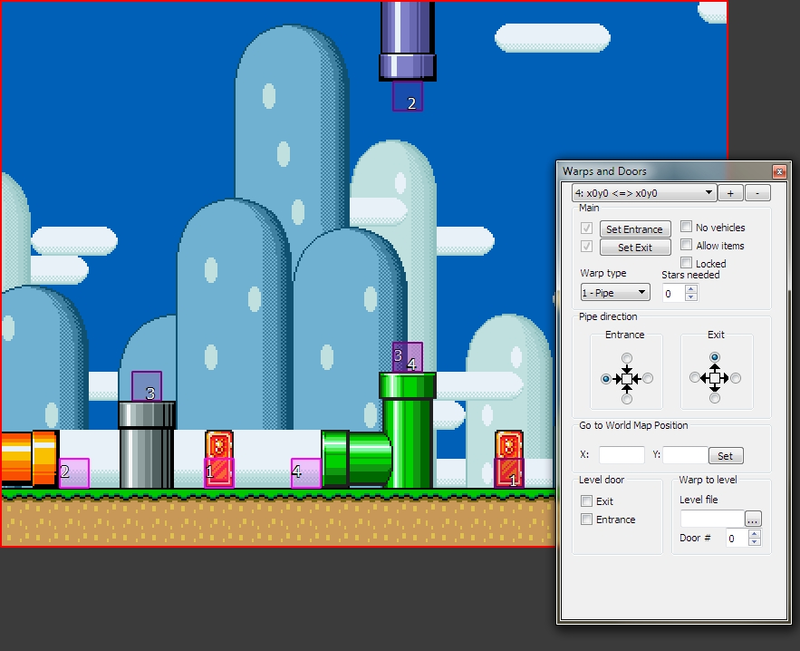 I just add "Export to image" function, but only in sources, new 0.0.5 release I will publish later, when I will make image export configuration. i am will make video tutorials on youtube(in beta version). A very comprehensive example of all the features! Awesome, MacOS build coming tomorrow! 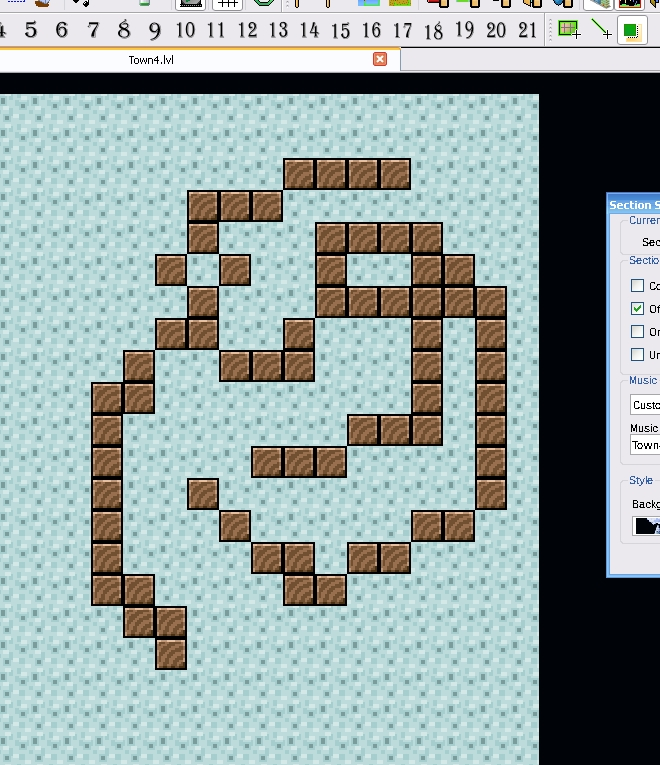 Also, are sizeable blocks working properly in the windows version, because they don't show up in their proper sizes in my version. Last edited by Veudekato on 17 Apr 2014, 10:54, edited 1 time in total. "The program can't start because Qt5Network.dll is missing from your computer. Try reinstalling the program to fix this problem." It would save me re-downloading the latest version again as it takes about an hour download. Thanks. 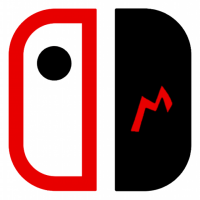 I have a question: Is there any news on the engine and the editor of the project? ImperatoreXx wrote: :) hello to everyone! 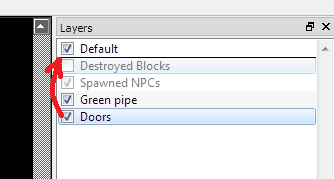 Yes, I have some news for the editor: Me and Kevin are almost done with 0.0.8 for publishing, but there are some bugs and defects in the door placing/controlling, which need to fixed. 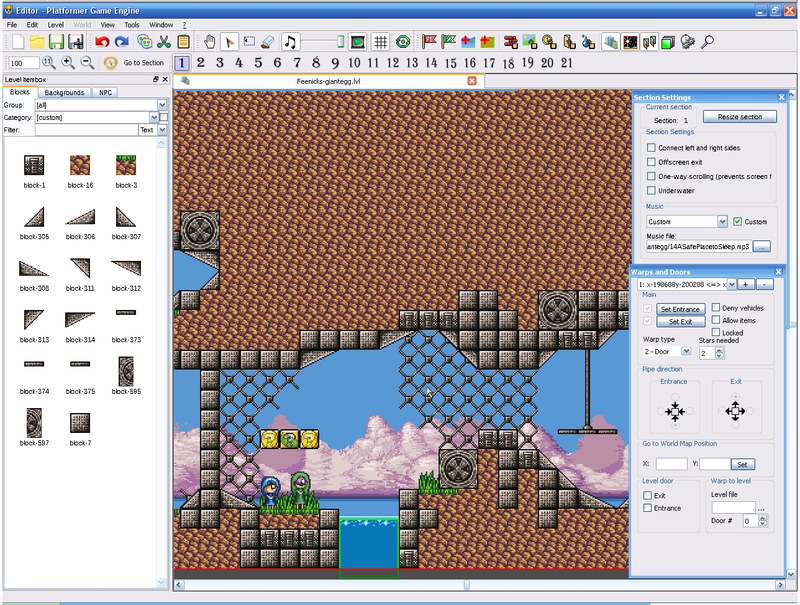 And I think that the Editor 0.1.0 will be like a full level editor release (without world map editing), and after the implementation of the world map editing, the Editor will be done in 0.2.0 version, and we will start development of the engine part, which will allow testing/debug of levels/worlds, and includes the main playable application. 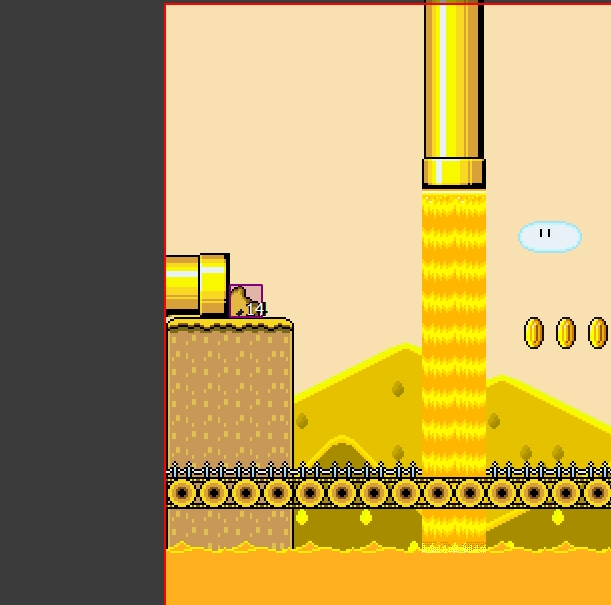 After this releases, I can start implementing new game-play features, such as weather, global switches, foreground scenerys as effects on moving (for example: trees close to player's screen, ad background, but as little pictures, which will be moved horizontal/vertical relative to player's camera, but with 2x speed), timeout for playing the level, etc. 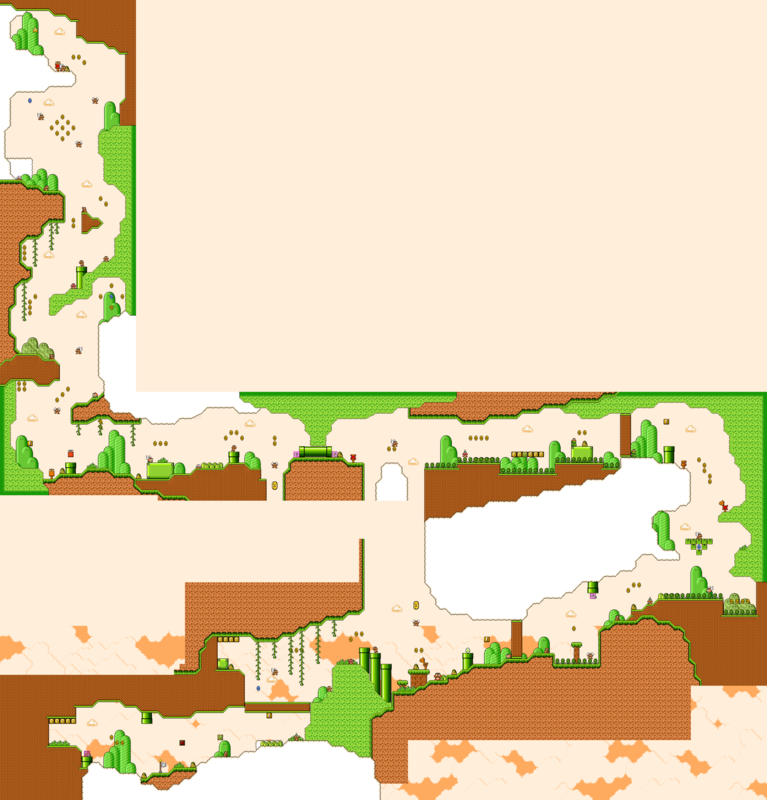 But in the future you could have a level that takes place both in the background and in the main area like donkey kong country returns? 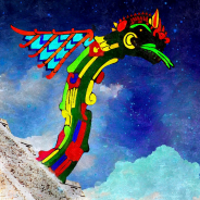 ImperatoreXx,post your offers and interests in /viewtopic.php?f=11&t=71 please . 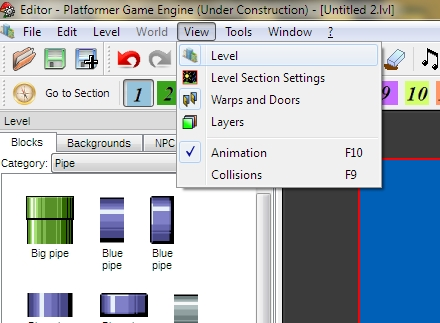 well,answer- this engine are 2D. 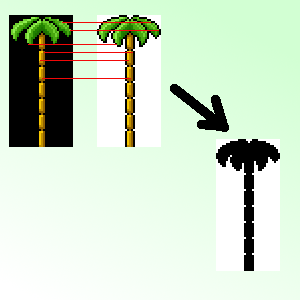 donkey kong use background models. 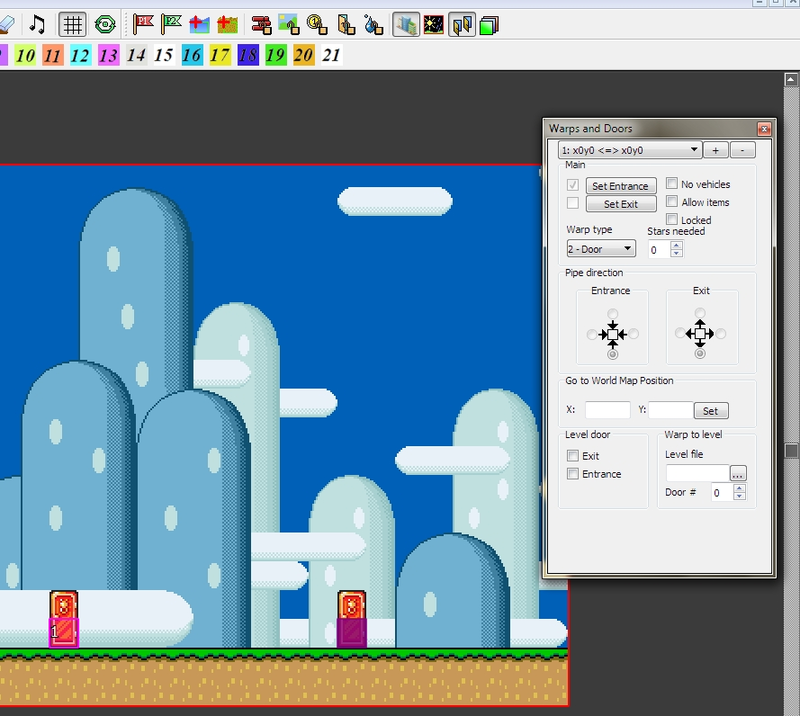 you can make background objects. 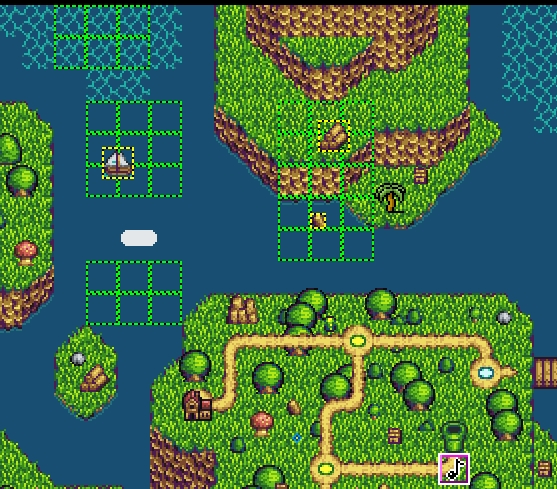 or wohlstand will make (in engine) 'magic' background with lines,when 1 island is 1 zone - second islad second zone. about magic backgrounds - http://wohlsoft.ru/docs/Backs2 list.pdf. i hope im understand your question . or you mean other?